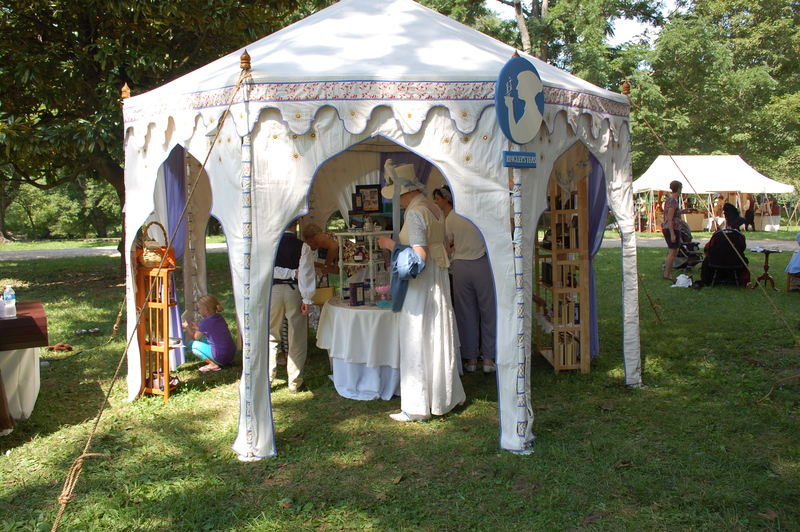 For fans of Jane Austen, one of the must-attend events of the year is the Jane Austen Festival in Louisville, put on by the Jane Austen Society of North America Louisville Chapter. This weekend, we enjoyed our third visit to the festival, which is now in its 7th year. I applaud the many women and men who work hard all year so we can spend a day living this beautiful era in history. 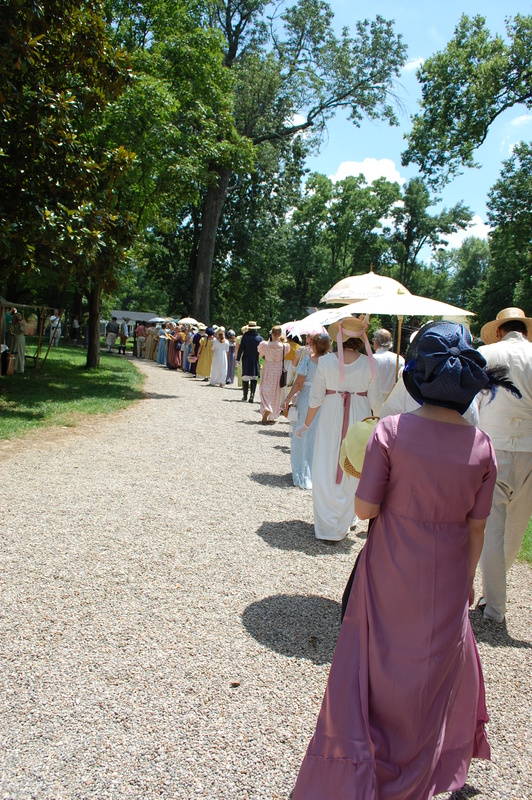 Held at historic Locust Grove, the festival is always a wonderful feast of colors, sights, and smells. We enjoy the vendors, the author talks, the fashion show, the food, and the people. I was lucky to be approached by several fans of the blog-it was a real treat to talk with these women and one gave me a lead on getting some new dresses for next year’s event (thank you Stephanie!). I’ve put together a photo tour of our day. For once, the weather was tolerably cool and we only saw a few clouds and spits of rain. I wish I could convey the feel of the event to you in the photos-the gentility of the men, the kindness of the ladies, the feeling of calm, of not being in a rush, of walking and just enjoying the company of the girls and the beautiful sights around us. It’s such a contrast to the outside world! Of course, the use of iPhones in the midst of all that historic scenery makes me giggle a little but it would be a waste to not capture as much of the beauty of it in photos. I did really love the fact that the family that runs Bingley Tea’s dresses in historic clothing, has a beautiful canvas sales tent and uses a smart phone as a cash register! Lily, Ella and I on the morning of the festival. These dresses are so comfortable. Straw bonnets will make your head itch, though! 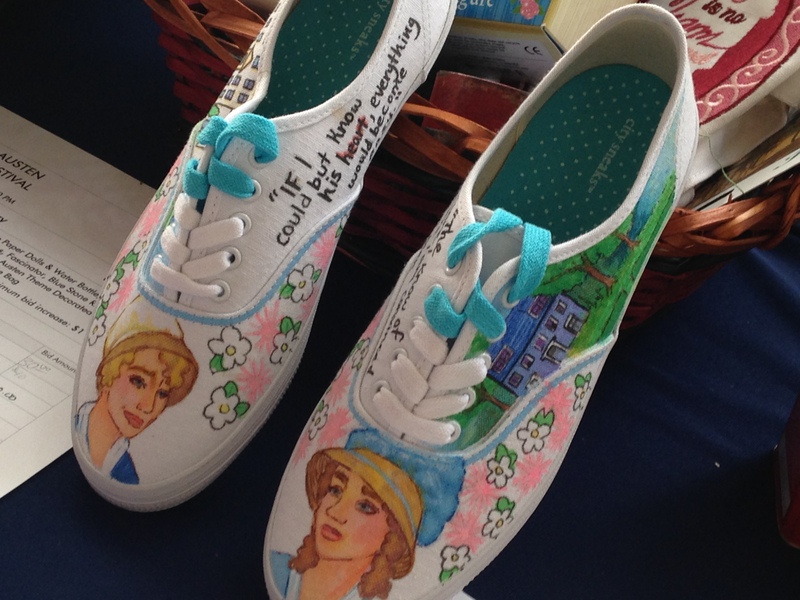 We loved these hand-painted shoes on the silent auction table. 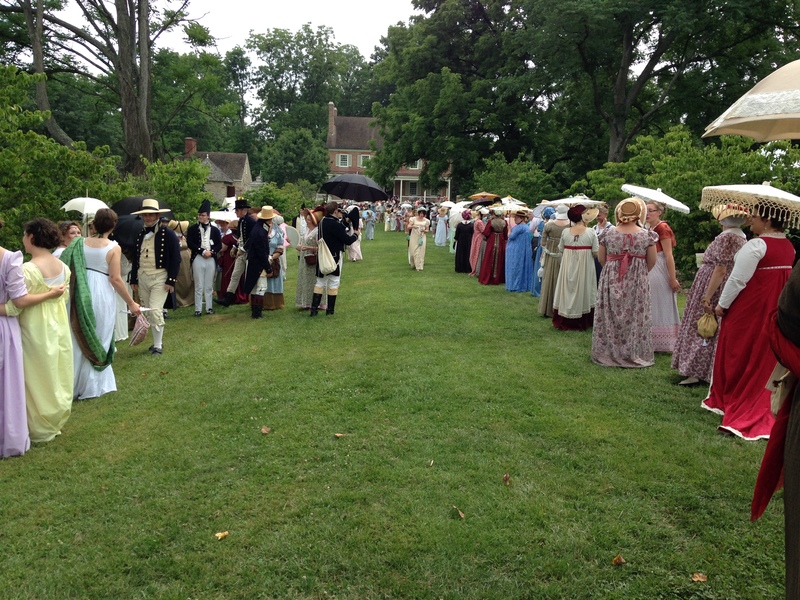 The Locust Grove estate is the perfect setting for this event. It’s expansive lawns leave plenty of space for everyone. 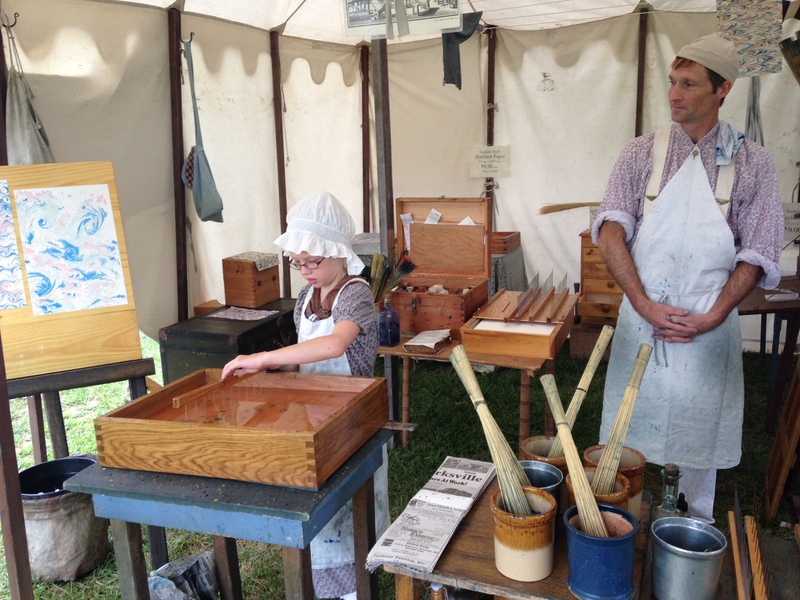 This young lady was swirling paints to stain beautiful stationery and notebooks. I tried to pack an authentic picnic lunch. These young people were playing lawn tennis while we ate our lunch. 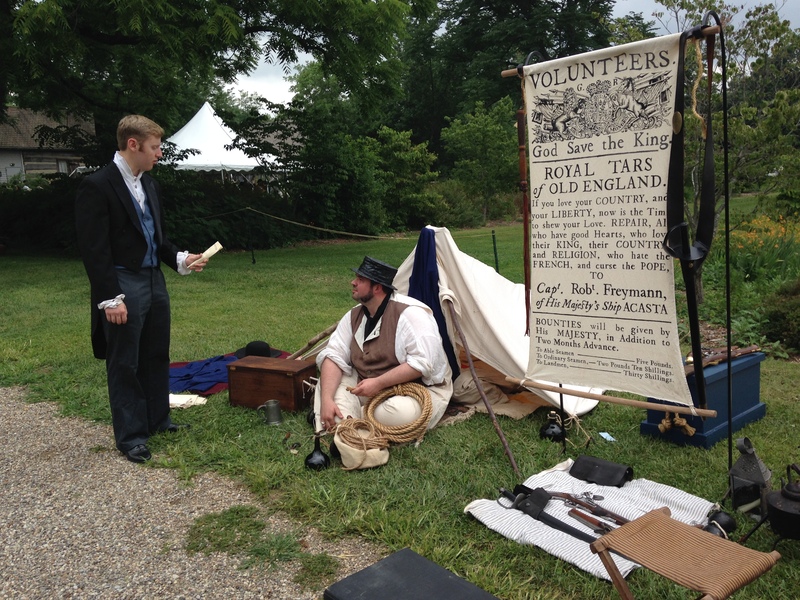 One of the cool new features this year was the military encampment. 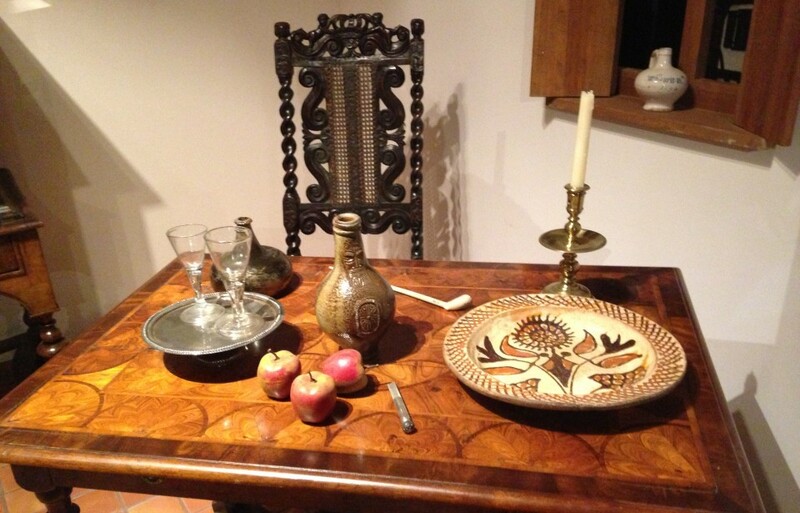 This table gives you a sense of the provisions provided to the men-a good lesson for the girls! I loved this display. 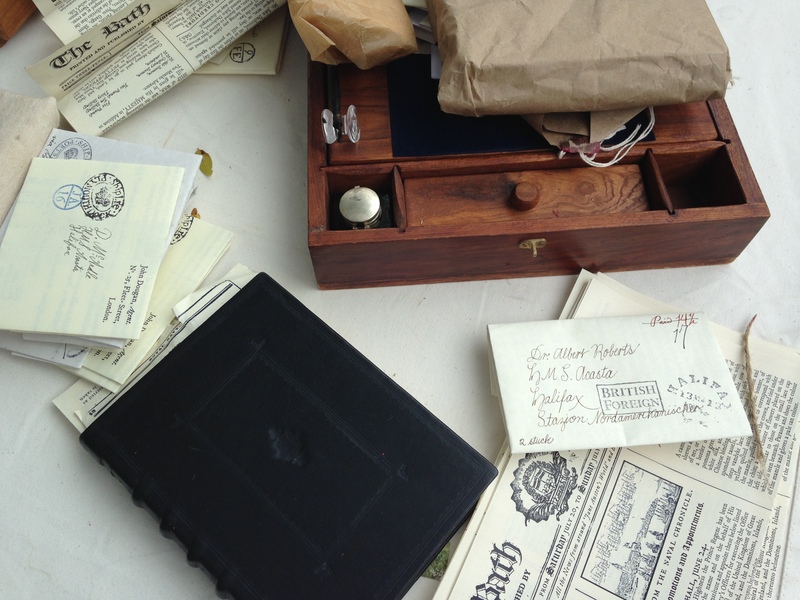 I think they gathered letters from volunteers a month ago and presented them to the military men in a packet, like they would have gotten while in service. I was so sad that I ran out of time to include one from us! 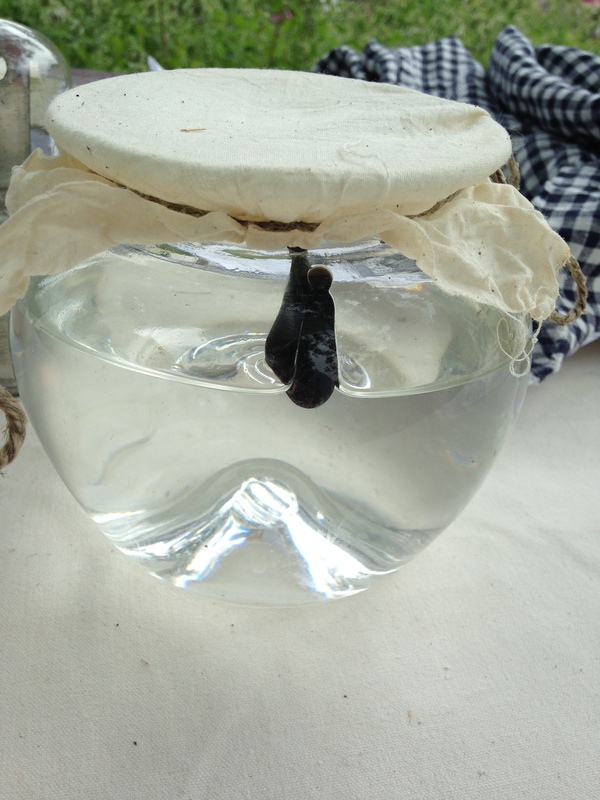 Yep, there was a table with real leeches! Hooray for modern medicine! We wandered down to the creek this year, to this little outbuilding. 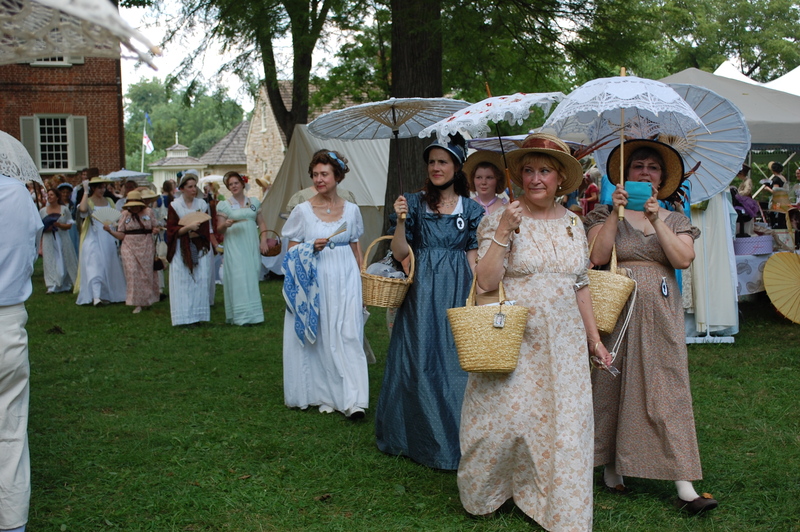 These ladies were lined up for the fashion show-always one of my favorite parts of the festival! We LOVE the shadow puppets. This guy has an amazing reading voice and his wife does the puppets behind the screen. It’s a bit dark down there in the basement so please excuse the softness of the photo! The girls’ annual photo on the porch. I HOPE we broke the world record this year for most people promenading in Regency wear. It sure seemed like we had more people! 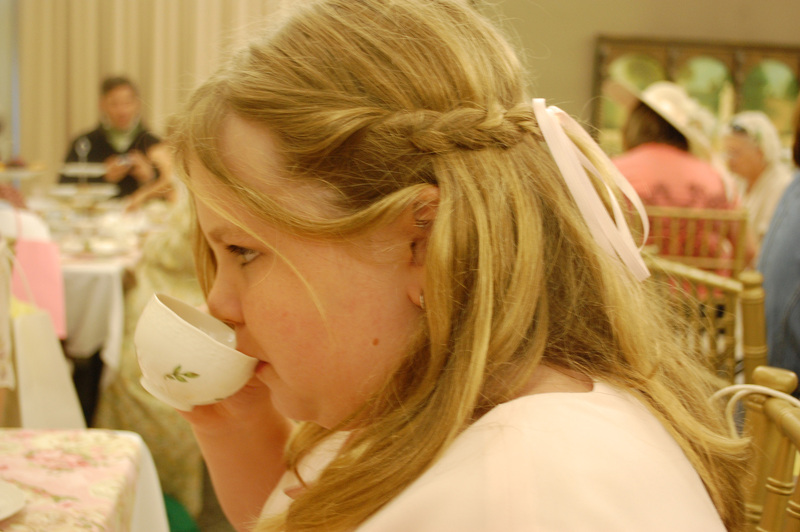 Lily started drinking milk in her tea after her visit to England last year. Her favorite flavor of Bingley’s is Marianne’s Wild Abandon. 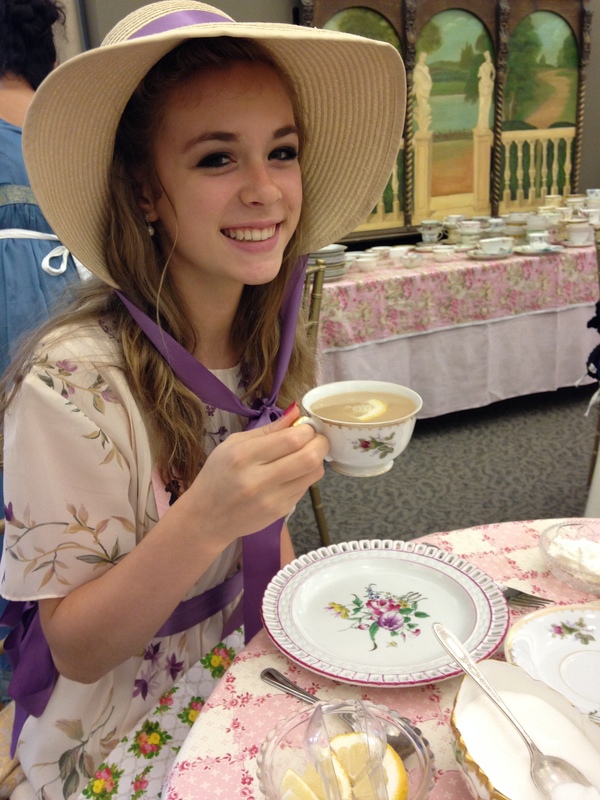 I thought Ella’s teacup was so beautiful! Her favorite flavor is Mrs. Jenning’s Delight. I think we each drank 12 cups of tea! This year’s menu. Let me tell you, that Pimento Cheese/Benedictine stack is SO YUMMY. 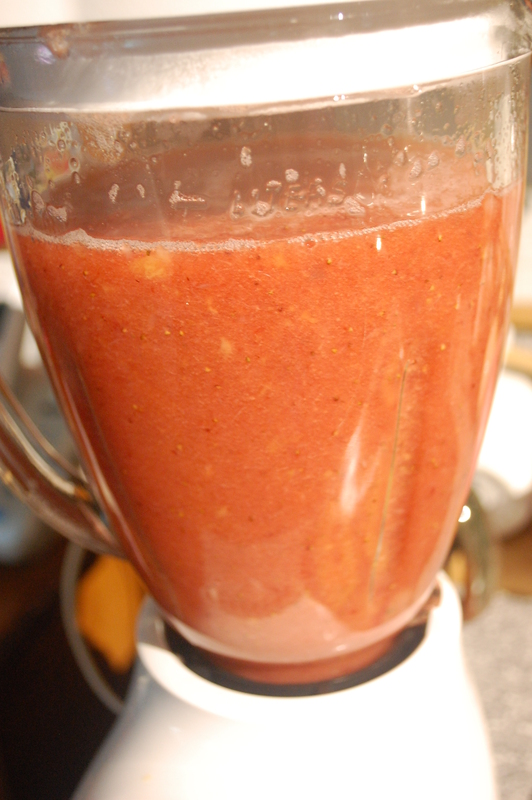 I don’t know what’s in it, besides pimento, but MMMMM. 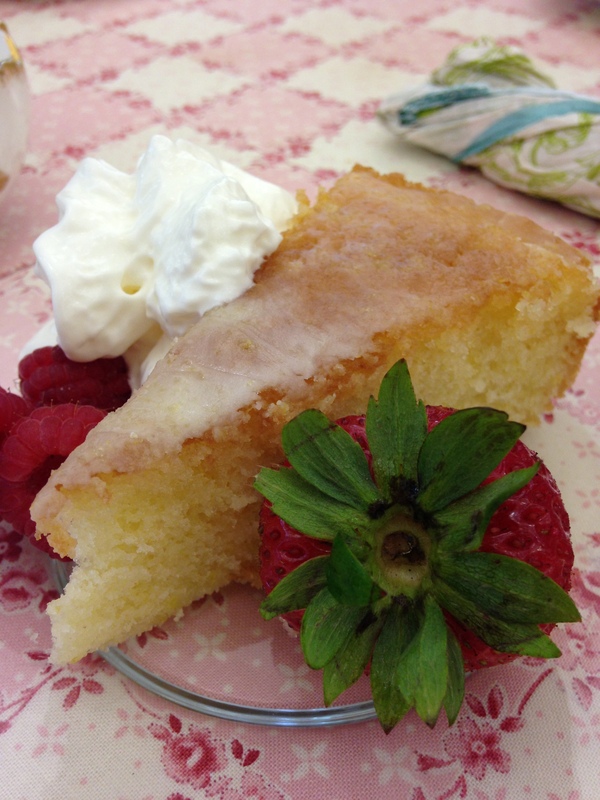 We all had Mr. Darcy’s Favorite Lemon cake. It was divine-tart and really delicious!! And I was so sad to leave. It’s hard to wait a whole year for the next festival but next year, we hope to attend the ball and you know that means-new dresses! We also hope to jazz up our day wardrobe. 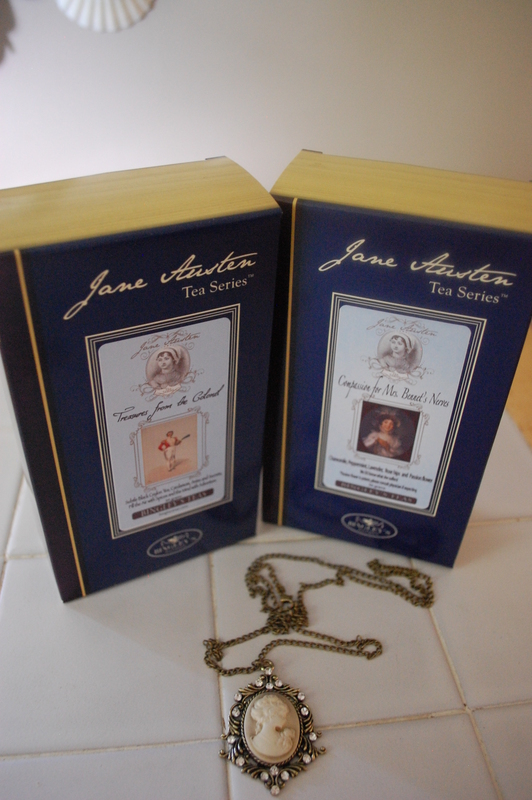 In the meantime, we’ll be drinking the many boxes of tea we bought and reading Jane over and over again. First, a victory in the garden! 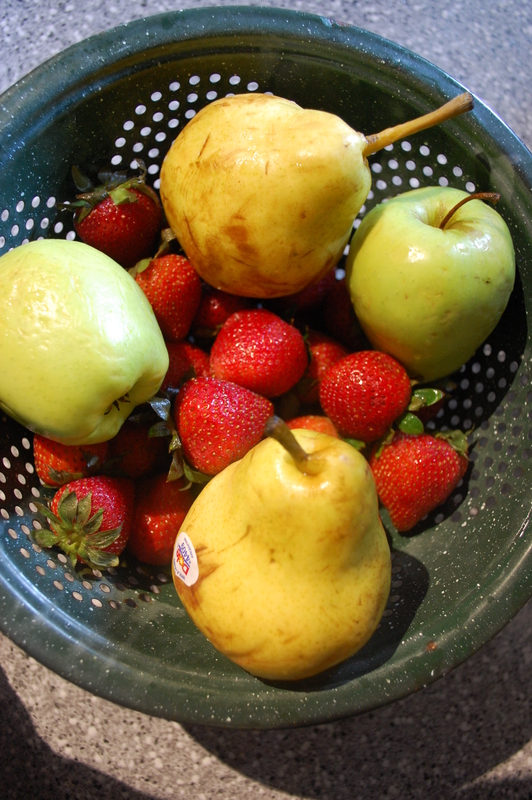 I hadn’t been in my vintage garden for four days, so I went out last night to check it and look what I found! 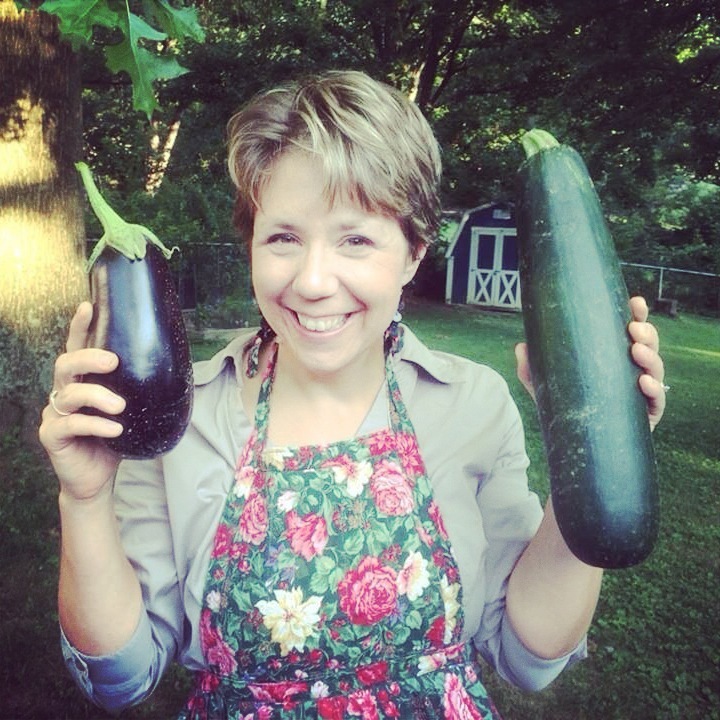 An eggplant and a huge zucchini! Now, for the good stuff. 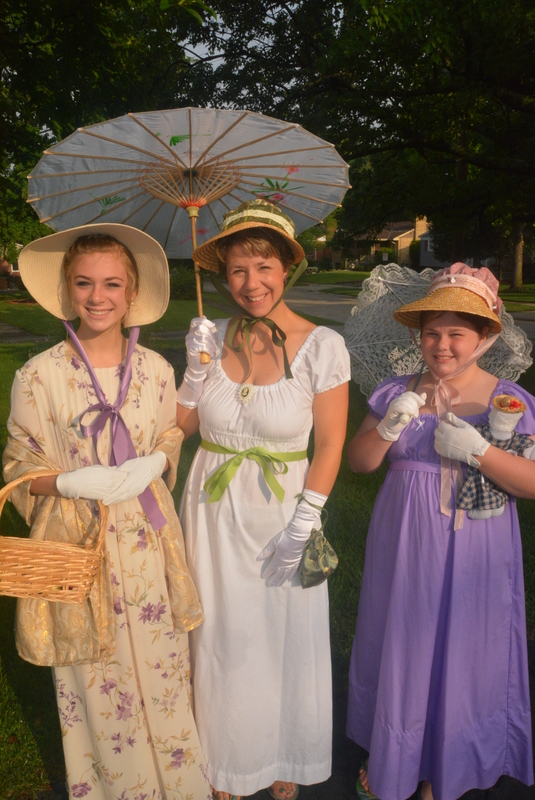 I am SO EXCITED because the girls and I are headed to Louisville tomorrow for the Jane Austen festival! This is our third visit to the event, which has become a summer highlight for us. 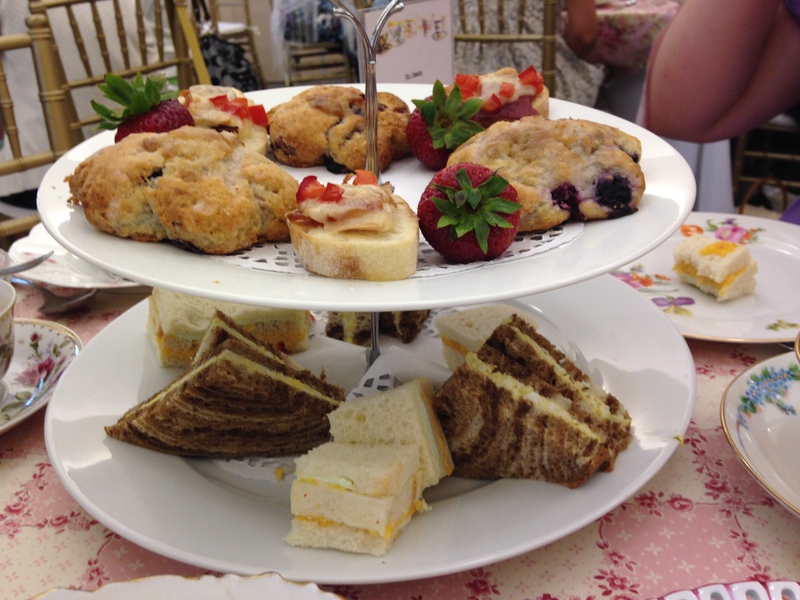 The girls at tea. I think they love it as much as I do. It’s a great mother-daughter bonding day. 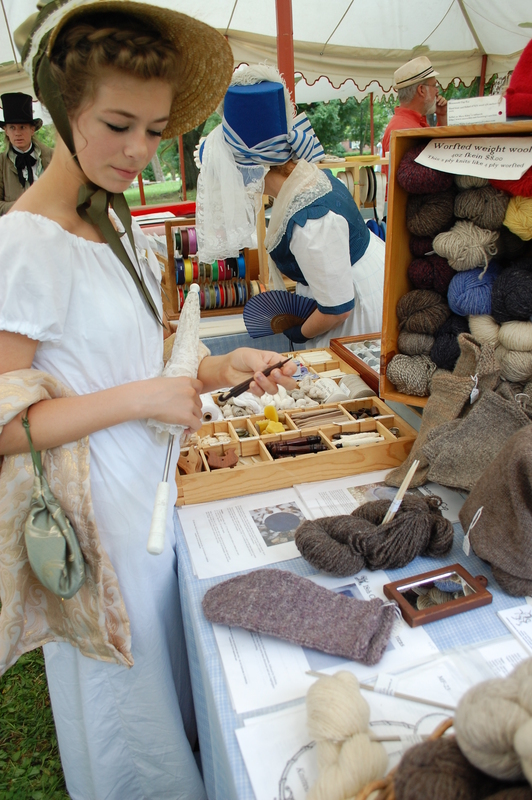 We dress up in our Regency clothes, act elegant and refined, shop, enjoy good food and tea, and learn new things about the era. It’s such a beautiful day-the clothes, the manners, the food- and it’s always a great way to make history come to life your kids. I always make a point to tell my girls about the hardships the women of this era faced. 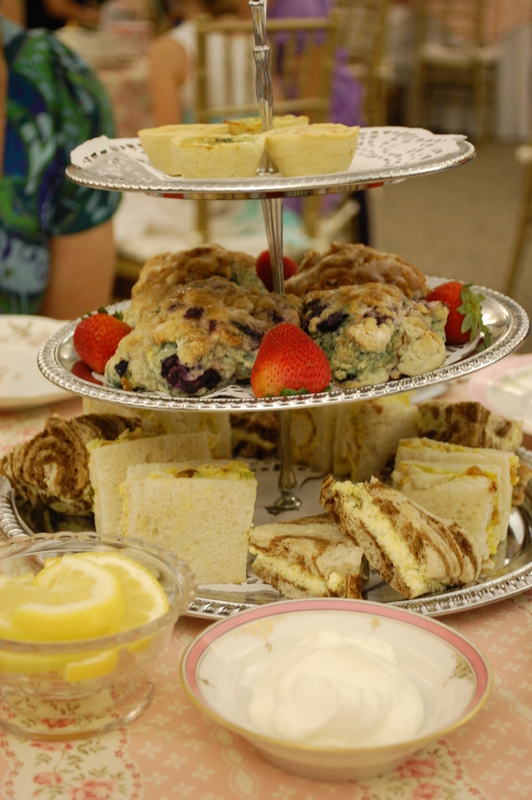 It wasn’t all tea times and piano playing and bonnet-wearing. These ladies had to depend on men for their financial security. They faced life-threatening danger in childbirth. They endured the hardships of poverty and disease. This is why Jane Austen is so incredible-she was among the first women to make her own money writing novels and she created believable, flawed characters who found themselves in all kinds of desperate situations, but who persevered. 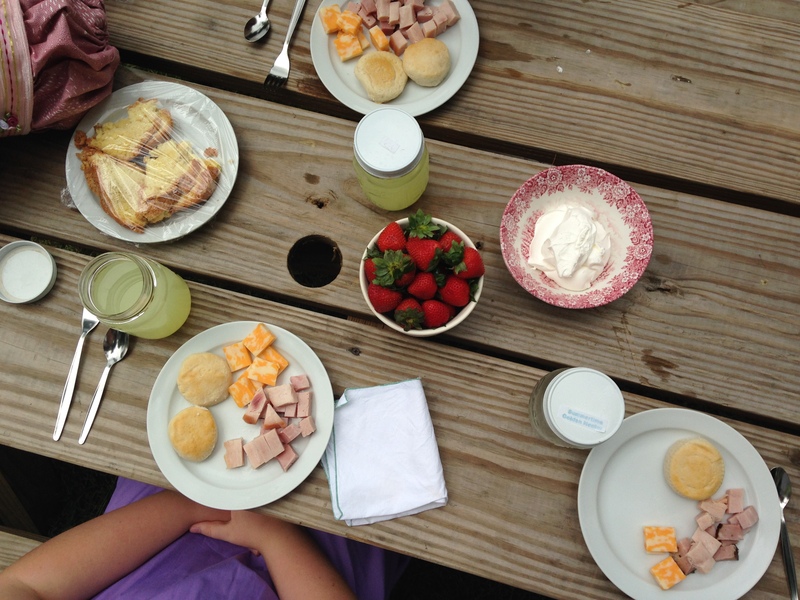 One of the big improvements the girls and I are making on our trip this year is lunch! I received a picnic basket for my birthday and I’m putting it to use. 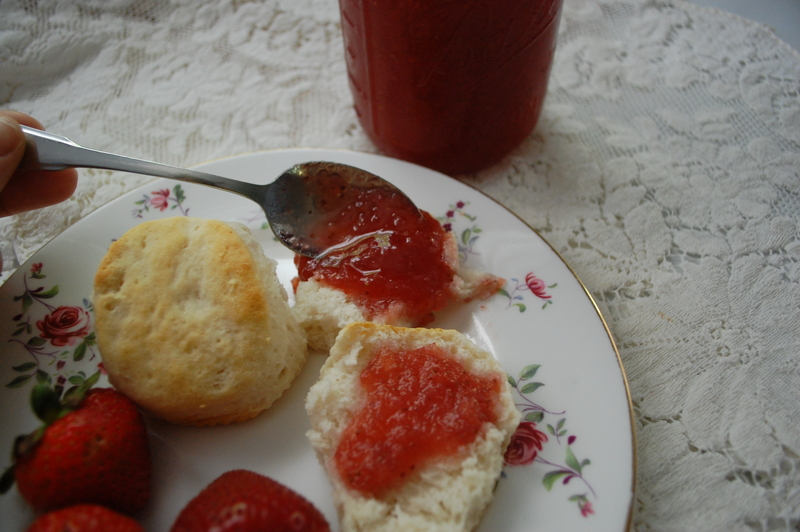 I’ll be packing us an authentic Regency-era picnic-cold meat and cheese, biscuits and jam, berries, some root vegetables from the garden, and a cake! 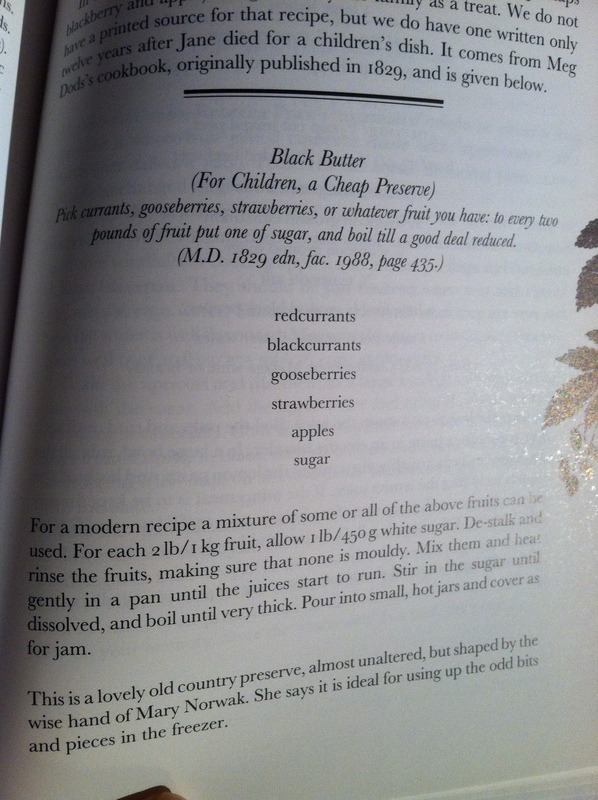 Specifically, this wonderfully delicious and easy cake which I found in Cooking with Jane Austen and Friends by Laura Boyle. You can’t tell it fell apart, can you? 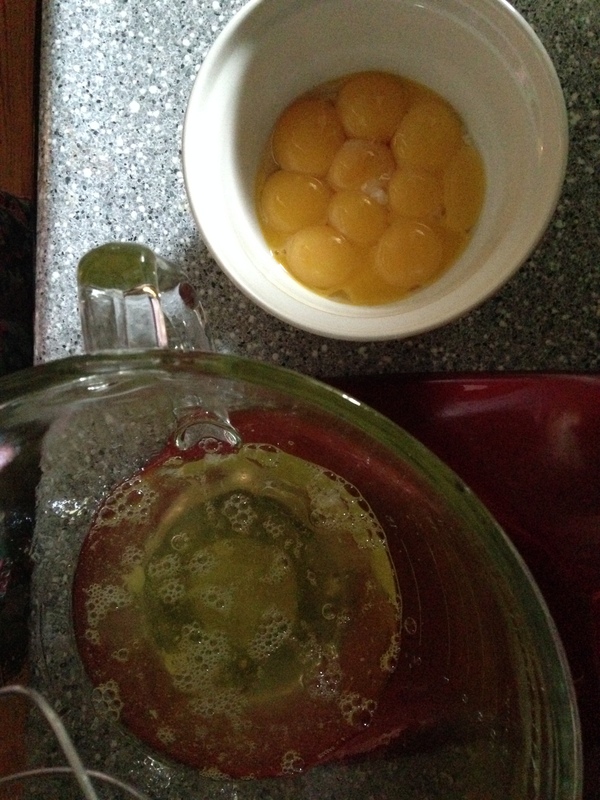 The main ingredients are ten eggs, separated. 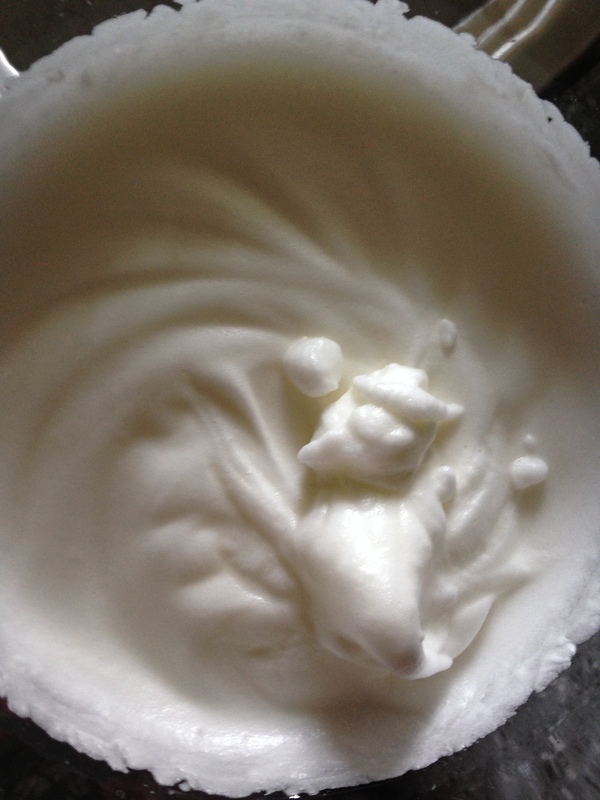 You whip the whites until they form stiff peaks. 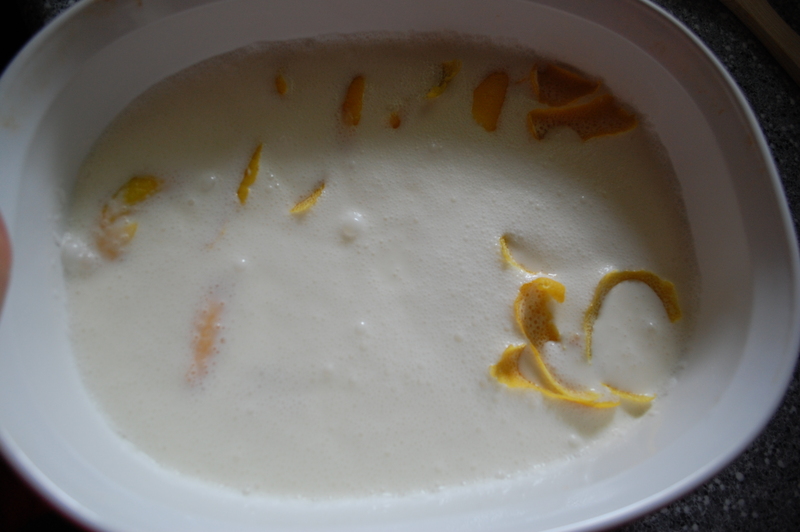 Then you beat the yolks, mix in the sugar and flour, and fold in the egg whites. 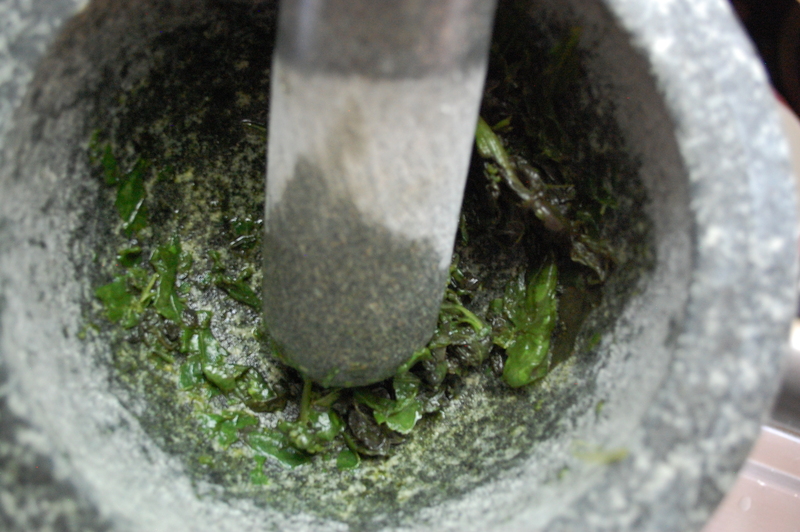 The fluffy mixture bakes at 325 for one hour. It fluffs up! Now, I do confess to having a bit of a disaster with the final product. 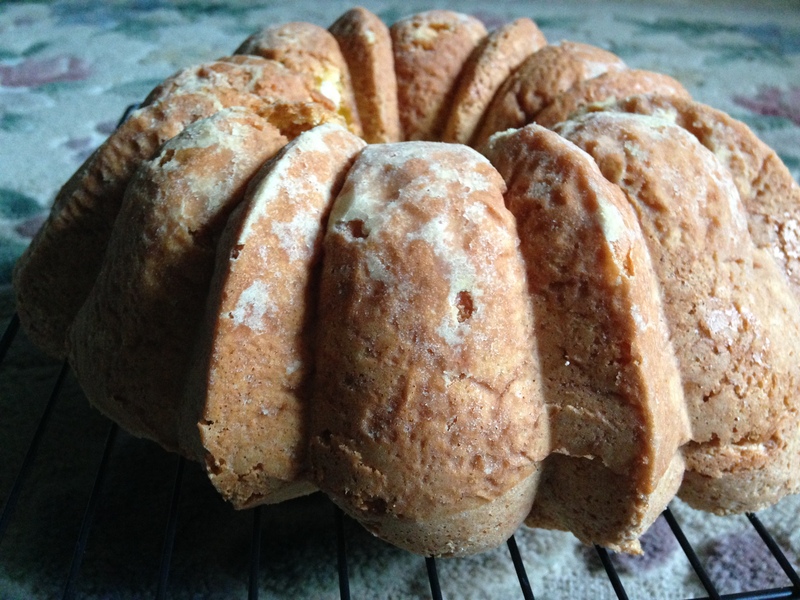 The instructions call for you to cool the cake in the pan, upside down like an angel food cake. I think I greased my pan a little too well because when my husband and I flipped it, the cake came sliding out-in two pieces! Now, it was still warm and we immediately put the two pieces back together and the sugar, which was still caramelizing, sort of glued the two pieces together. 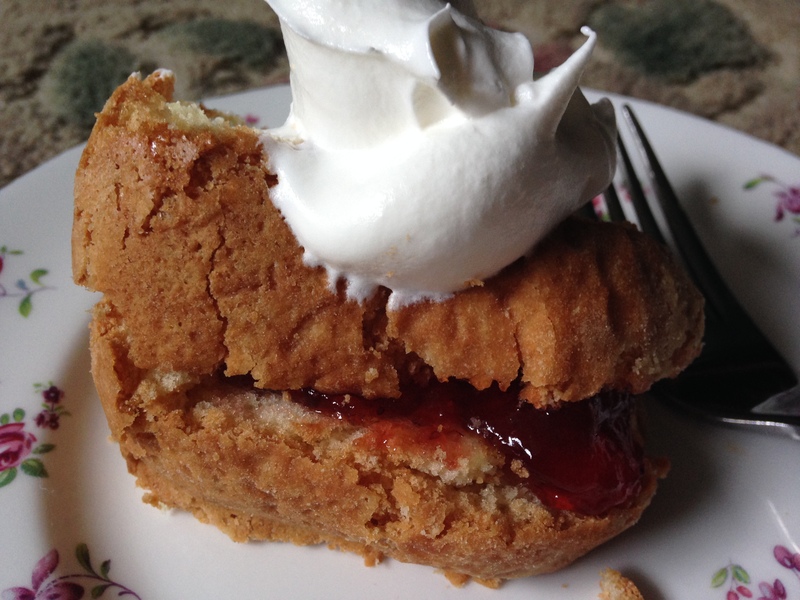 No matter, really-you serve this cake by slicing it thinly, and spreading some jam between two thin slices, then topping it with a dollop of whip cream. 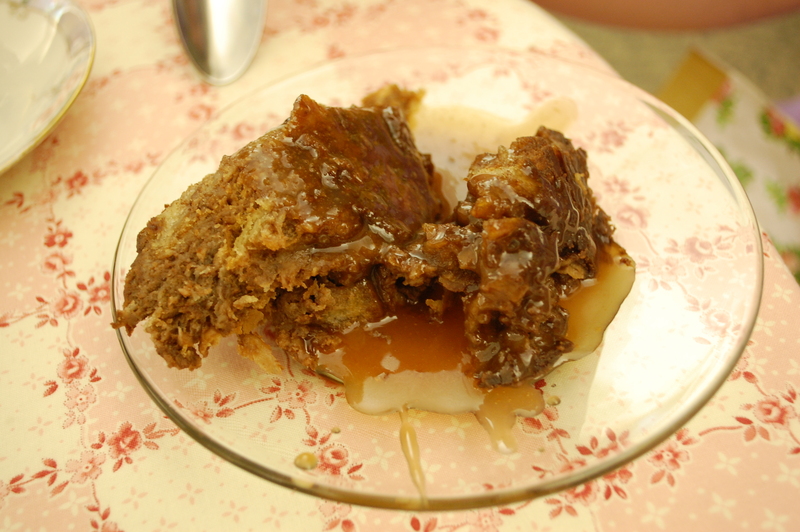 It has a crunchy crust and a fluffy texture inside-really yummy! 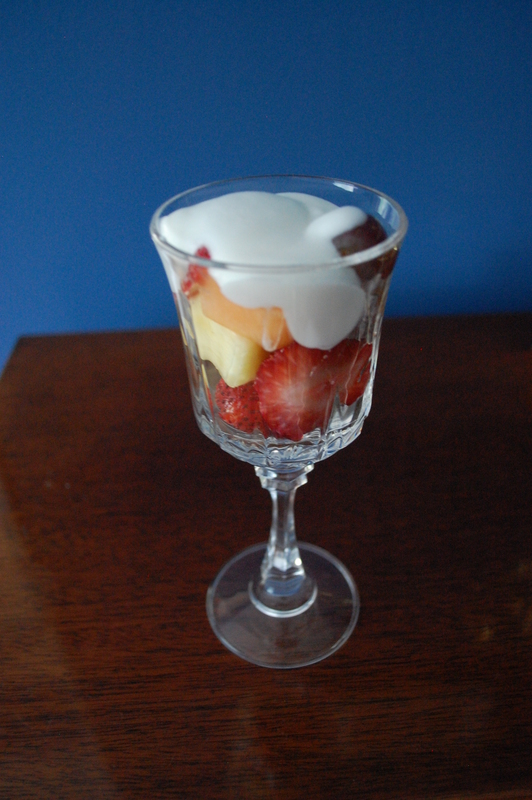 Dessert is so awesome, isn’t it? Preheat the oven to 325 degrees. 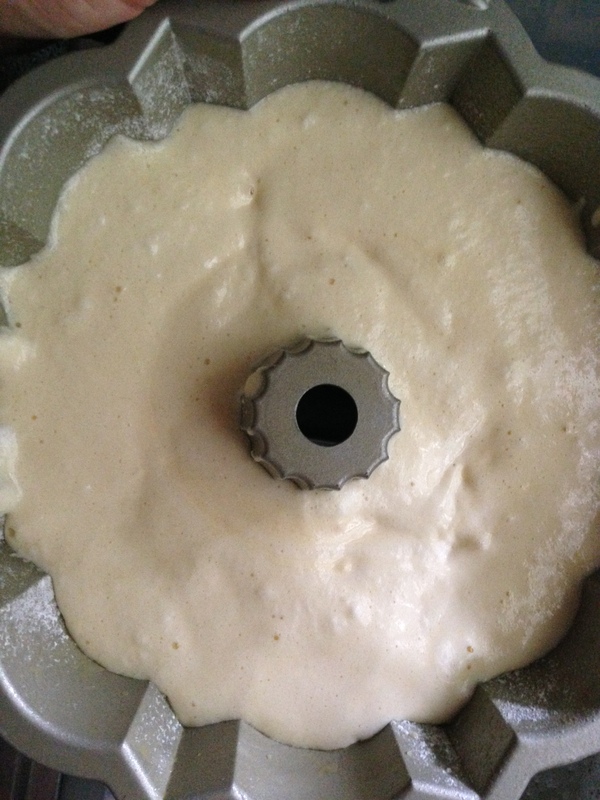 Grease and flour well a Bundt or sponge cake pan. 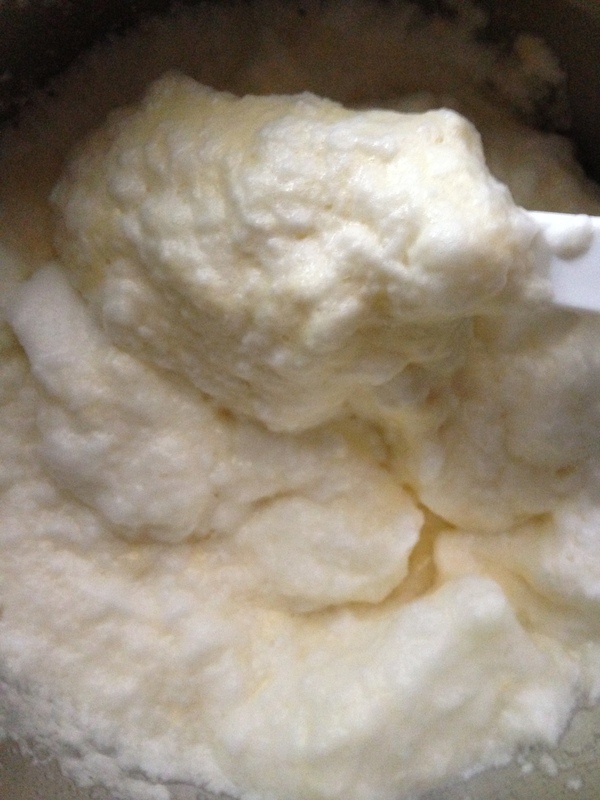 Whip the egg whites with a beater or in a stand mixer until stiff peaks form, about 10 minutes on medium high speed. Set aside. 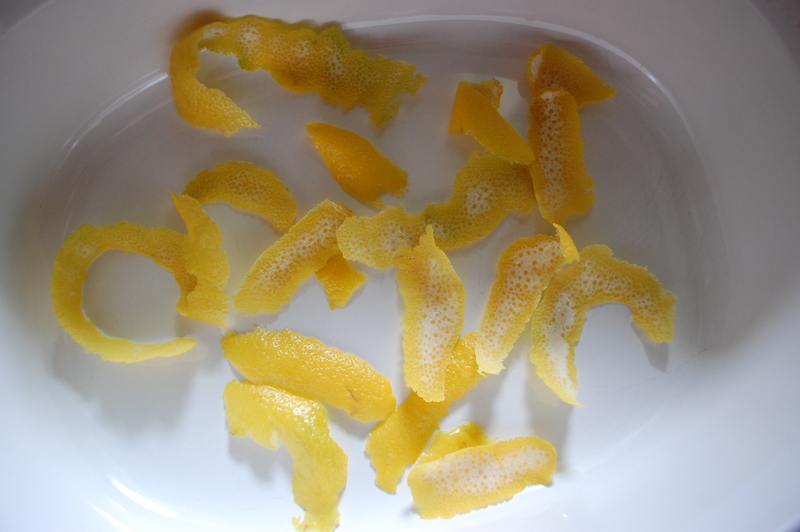 In a separate bowl, whip the egg yolks until foamy. 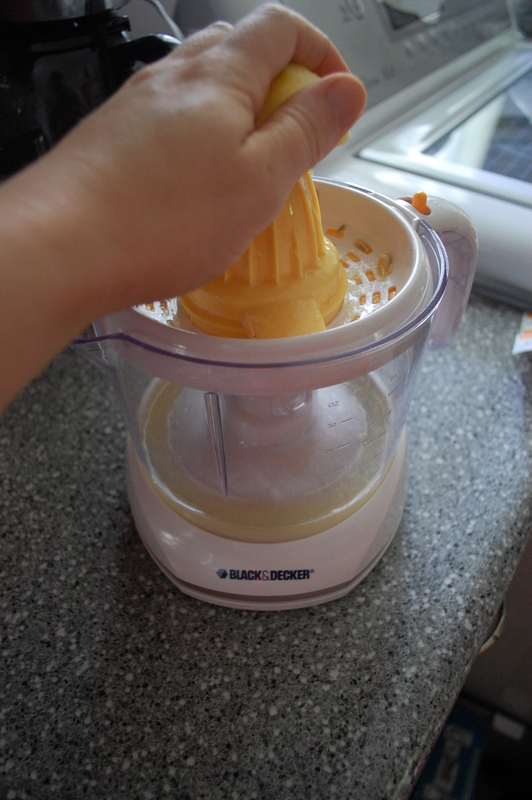 Add the sugar and, when that is well incorporated, mix in the flour. 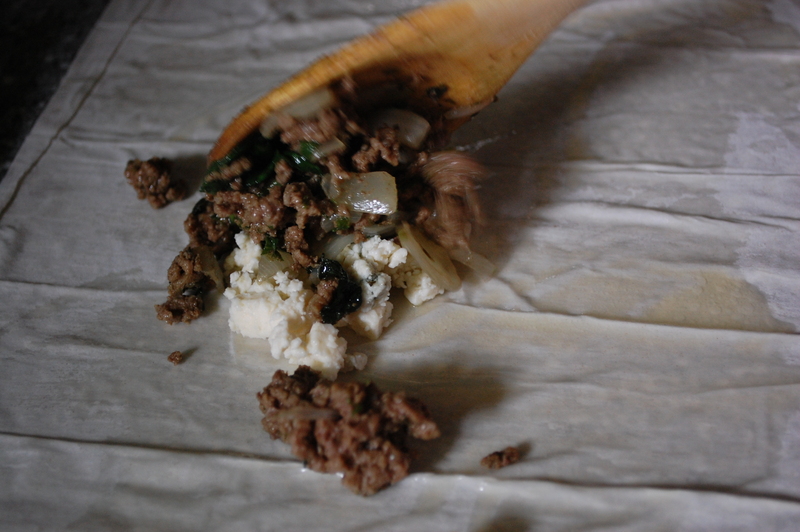 When the ingredients are well combined, fold in the egg whites slowly (I did mine in three sections). 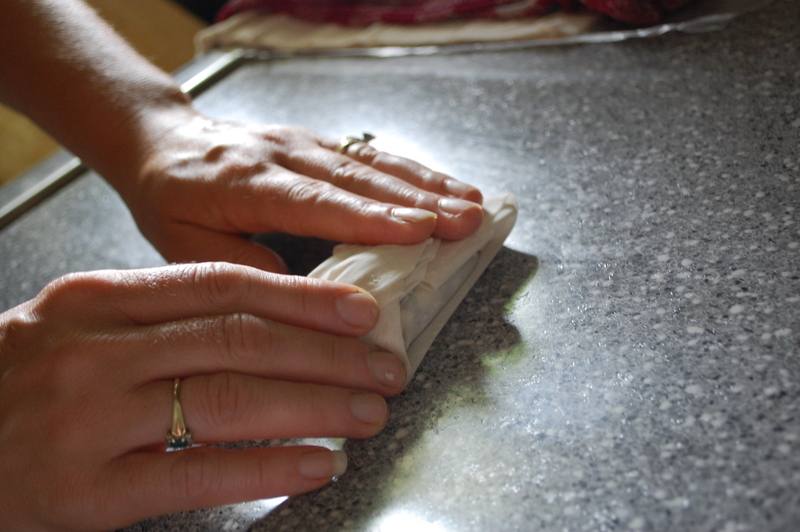 Pour mixture into the pan and bake it for one hour or until a knife inserted in the middle comes out clean. Cool on a rack, then remove from the pan carefully. 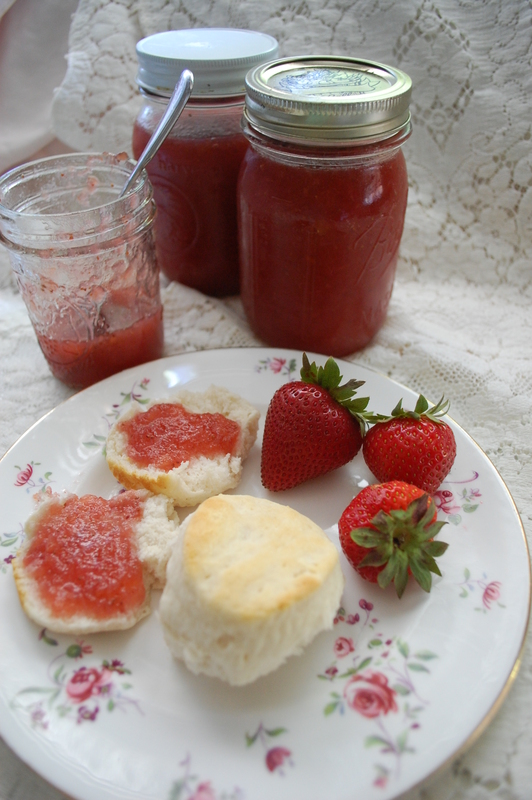 Slice thinly, spread jam between the slices, and serve with whipped cream. To say I cannot wait for tomorrow’s picnic would be an understatement. Here’s hoping for no rain! Watch for photos and a wrap up of the festival in the coming week and if you are attending, look for me and say hi! I’ll be wearing a white dress with a green sash and a straw bonnet with green trim! 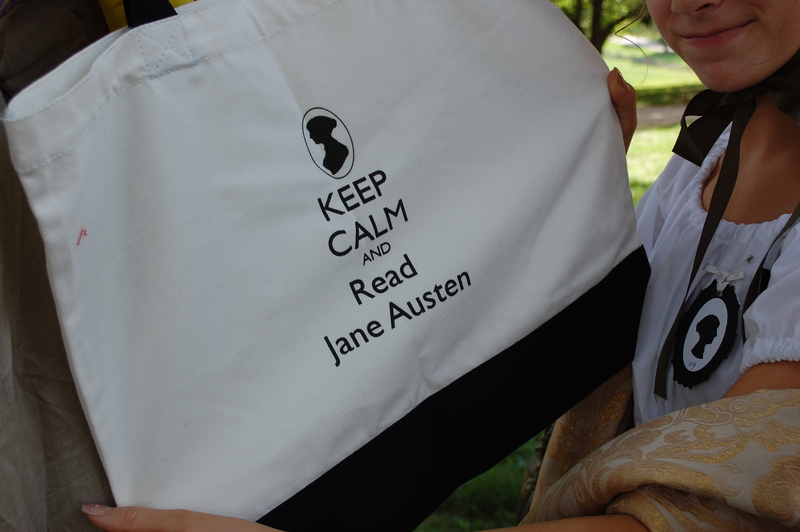 For more than a month, my dear readers have put up with my posts in anticipation of the Jane Austen Festival. I thank you for your patience and ask you to indulge me through one more… my review of this year’s festivities. 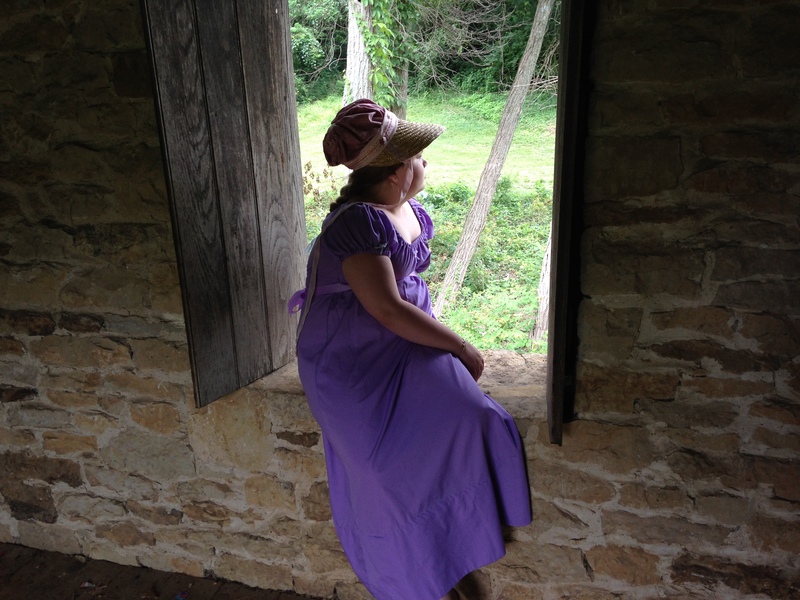 This was the second trip to Locust Grove in Louisville, Kentucky for my daughters-age 13 and 9-and myself and I am finally able to pinpoint why I love it so much-besides the obvious gratification of my Jane Austen obsession. 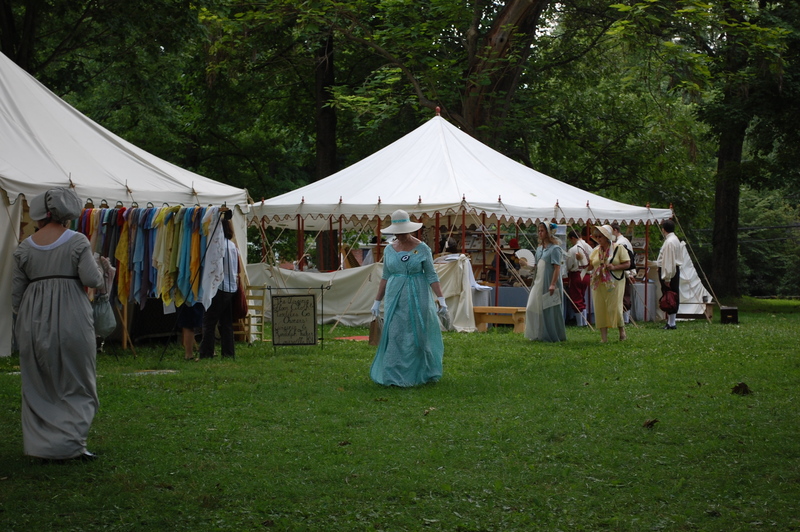 This festival is a feast for the eyes for anyone interested in Regency period costuming. This year turned into a particularly beautiful display of historic costuming because of an attempt by the organizers to get into the Guinness Book of World Records for the most people in Regency costume assembled in one location. The record is 409 people, set I believe in 2009 in Bath, England, which is the home of the Jane Austen Centre. Unfortunately, festival organizer Bonny Wise says we fell a bit short at 358 people. 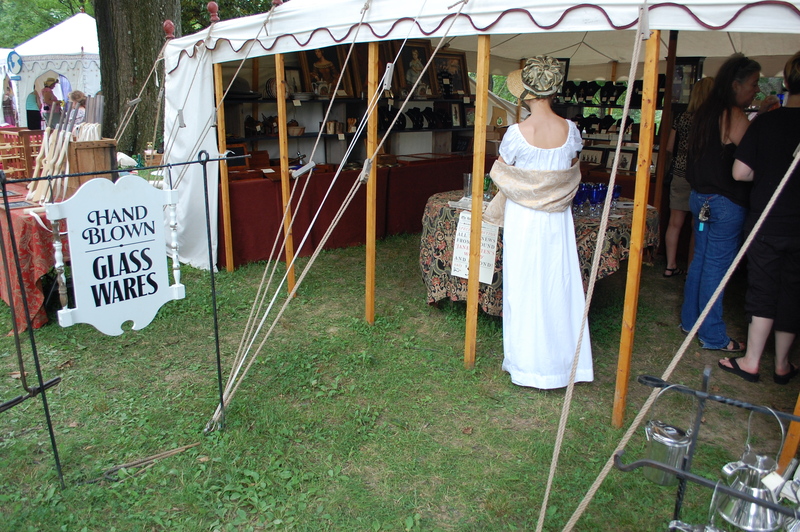 Perhaps we’ll try again next year-and let me tell you, if you love historic clothing, you’ll welcome a do-over… it was wonderful to see the wide variety of gorgeous dresses, cravats, hats, and parasols. I overheard this women talking about her parasol. I believe she used a vintage frame, which she re-covered. I am in awe of anyone who can do that! People lined up for the promenade. There were more costumed men this year, which was awesome. Take note gentlemen-the look is handsome and the ladies love it! The promenade. A bagpiper led us through the Shoppes of Meryton. I noticed a large number of spectators-and festival goers-with smartphones, taking photos and video during the promenade (myself included). I’m sure I’m not the only one who was struck by the way history and modern technology cross paths. 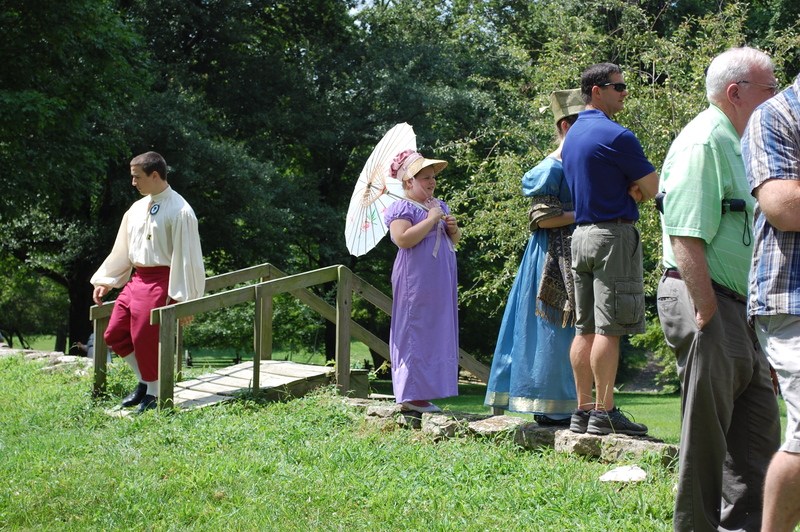 A promenade participant uses her smartphone to record the event. I was very pleased with how my daughter’s outfits came together-they both received several nice compliments from fellow attendees. The girls and I before we left for Louisville. This year, we decided to shop first. I love the vendors-there are all kinds of gorgeous items for sale. 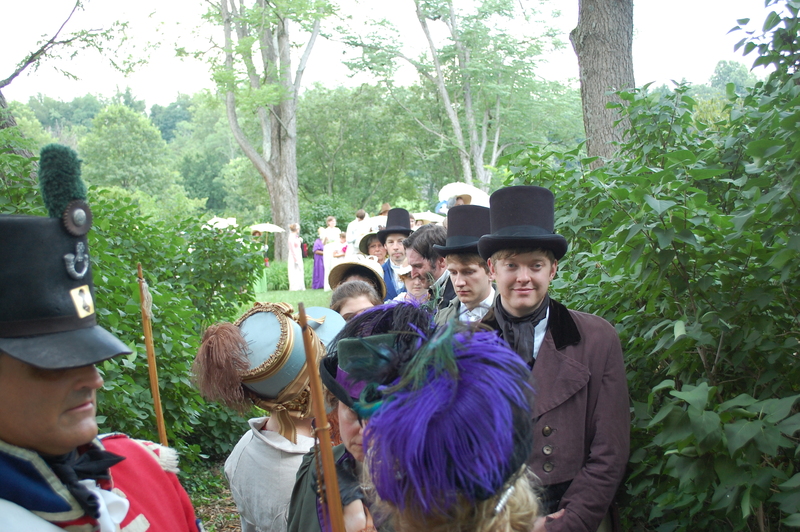 You can literally purchase an entire Regency outfit including hats, hat pins, gloves, turban broaches, feathers, and ribbons at the festival. My girls decided they wanted parasols. My younger daughter found a beautiful hand painted child’s parasol and a handmade doll at The Marquette Trading Company. Both were very reasonably priced. My eldest daughter found an exquisite lace parasol at Pride in Parasols. This vendor also had several museum pieces for sale, which I absolutely drooled over. 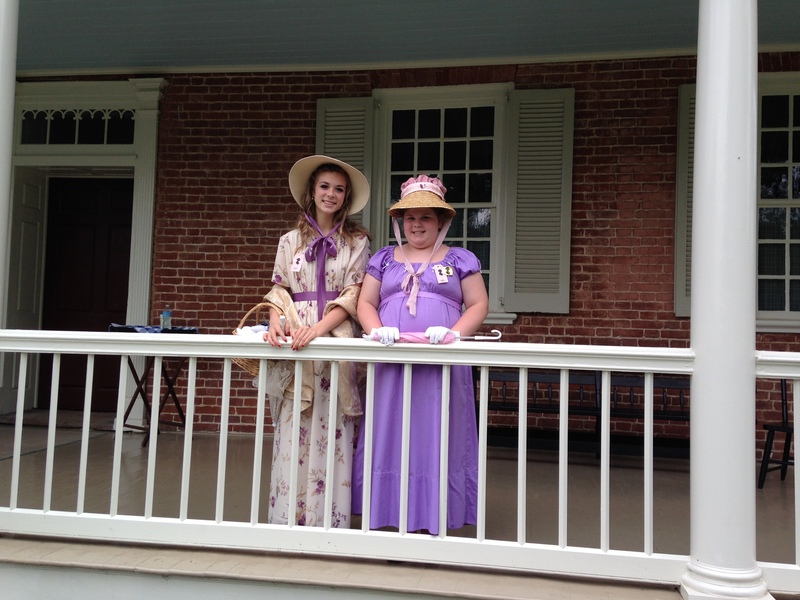 My girls on the porch of Locust Grove with their parasols and doll. Of course, no trip would be complete without a purchase at Bingley Tea’s. They have an entire series of teas to match the characters in Jane’s novels. We really love Compassion for Mrs. Bennett’s Nerves and we also bought a box of Marianne’s Wild Abandon. The Daniel Boone Trading Post is a great vendor-he has some really beautiful glassware, tea sets, writing desks, pipes, lanterns, jewelry, and more. We had to stock up on ink for our quills and Lily bought a wooden fan. I would love to buy a set of glasses from this guy sometime! I didn’t get the name of this shop, but you could buy fabric, authentic linen thread, Worsted weight yarn, and vintage buttons. 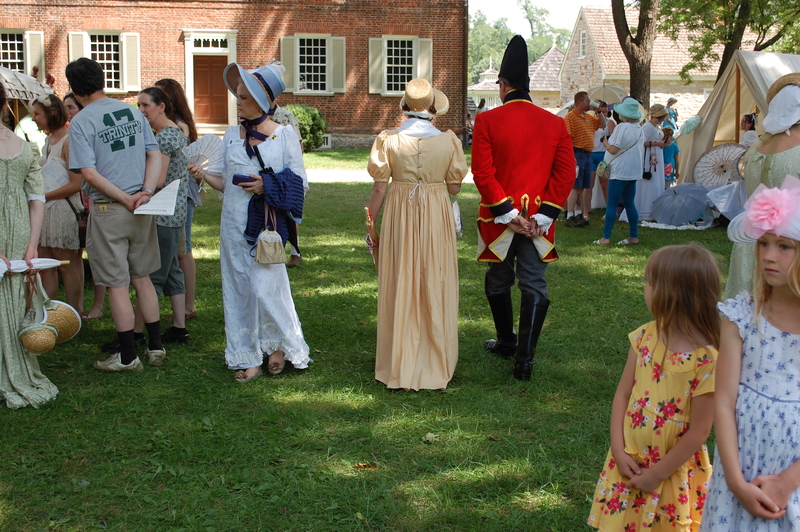 There were a number of fun activities, including a Mr. Darcy look-alive contest, a play about Elizabeth Bennett and Mr. Darcy, a Cricket match, a duel, and a bare-knuckle boxing demonstration, which my younger daughter found particularly amusing. Ella found a spot on the wall and watched the entire boxing match. 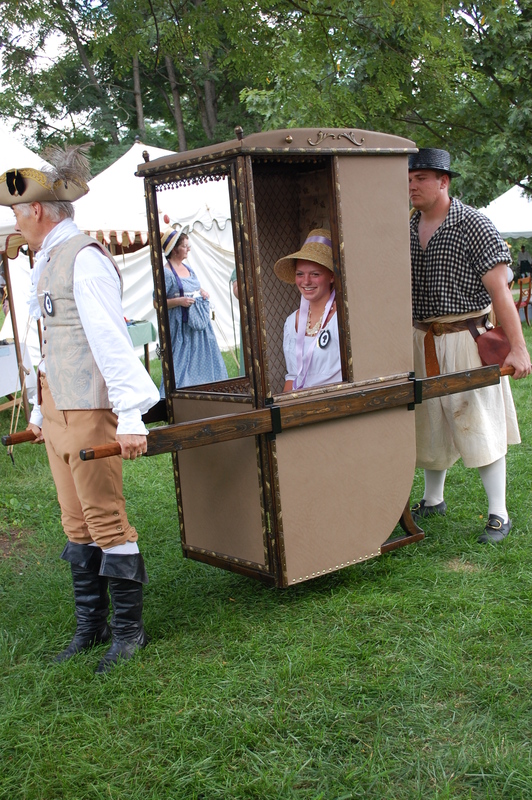 Someone brought this fabulous sedan chair to the festival and they allowed a few lucky people to take a ride. 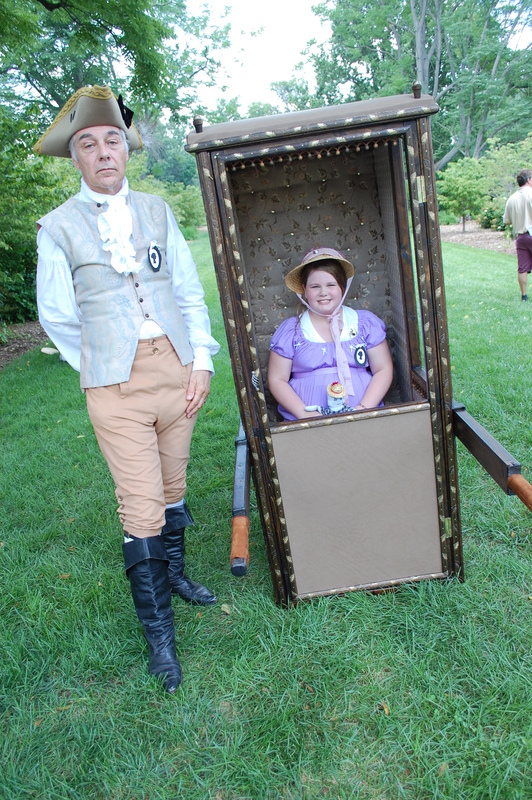 A young lady gets a ride in the sedan chair. In Regency England, sedan chairs were mainly used by the elderly or the infirm. This one is gorgeous-and the girls really enjoyed the chance to sit inside and have their photo taken. Lily in the sedan chair. If you go to the festival next year, you must look for the cellar, on the side of the house nearest the Earl of Sandwich Shoppe. There you will find the shadow puppet theater. It’s a cool respite from the July heat and the reader and his wife (I presume) have an amazing setup-some beautiful puppets and fascinating stories which are read from authentic 19th century story collections. 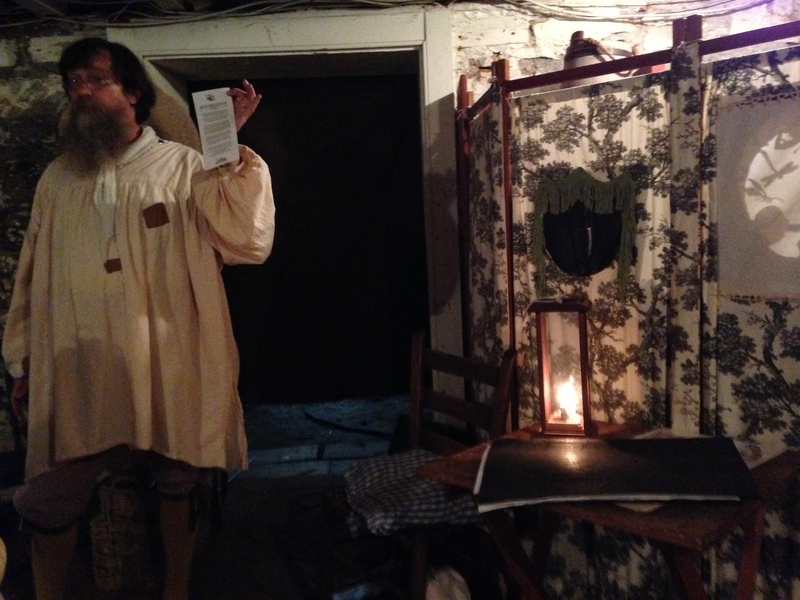 The shadow puppet reader closes the cellar door to begin another story. 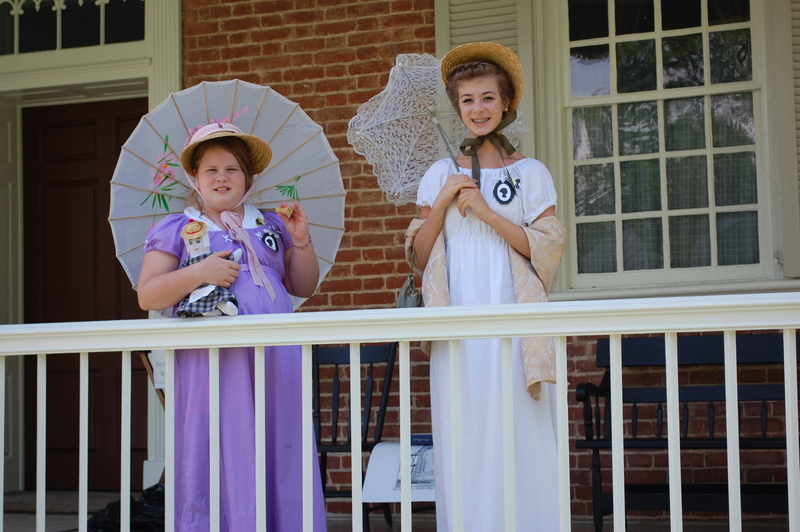 Of course, we toured Locust Grove again. I spent a great amount of time in the dining room and took photos of all the clothing and dishes on display because, frankly, I’m nuts like that. 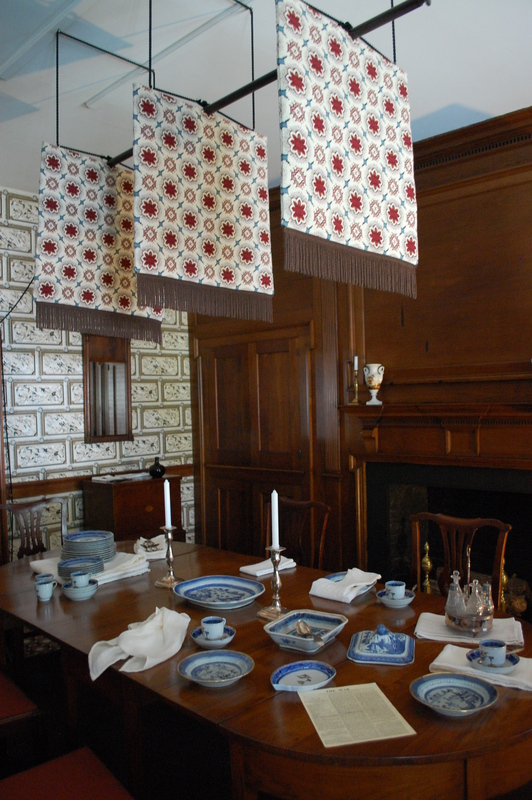 These fabric panels above the table are attached to a cord, which can be gently pulled by a servant, causing them to sway and fan the diners-the precursor to the modern dining ceiling fan! 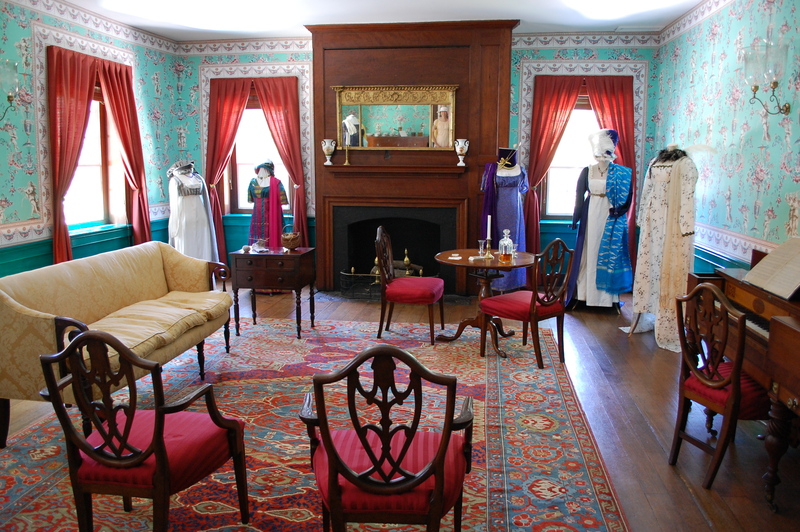 Clothing on display in the bedroom of Locust Grove. Finally, it was time for tea! YUM! The food was awesome. 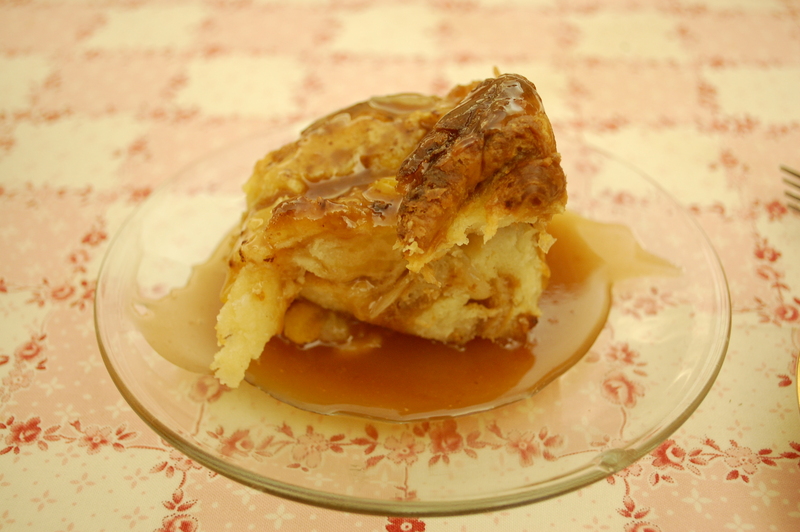 And I picked Apricot bread pudding with caramel sauce. It was out of this world! There are countless other features of this two day event which I haven’t mentioned-including a Regency ball that happens on Saturday night, which the girls and I plan to attend in a few years! 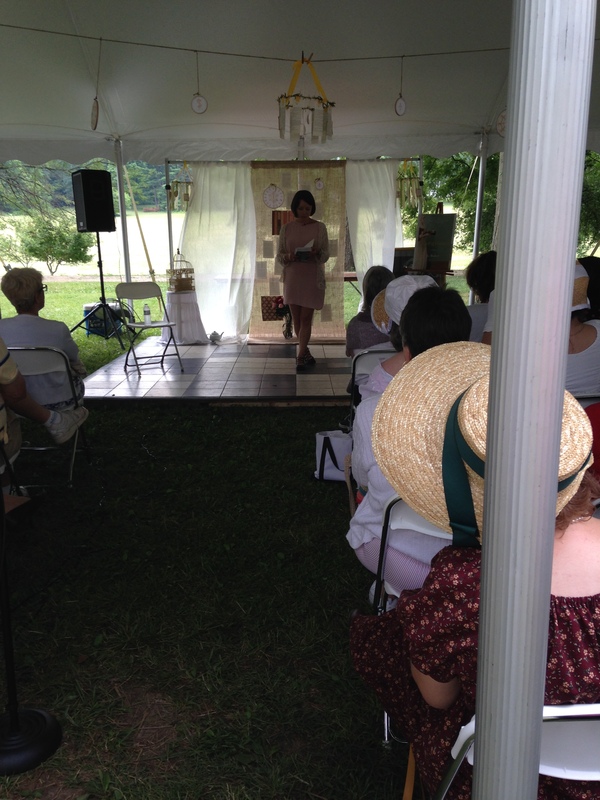 Suffice it to say, if you are even a remote fan of Jane Austen, the festival is a lot of fun and well worth the admission price. We’ll be back next year for certain and we hope to see you all there! 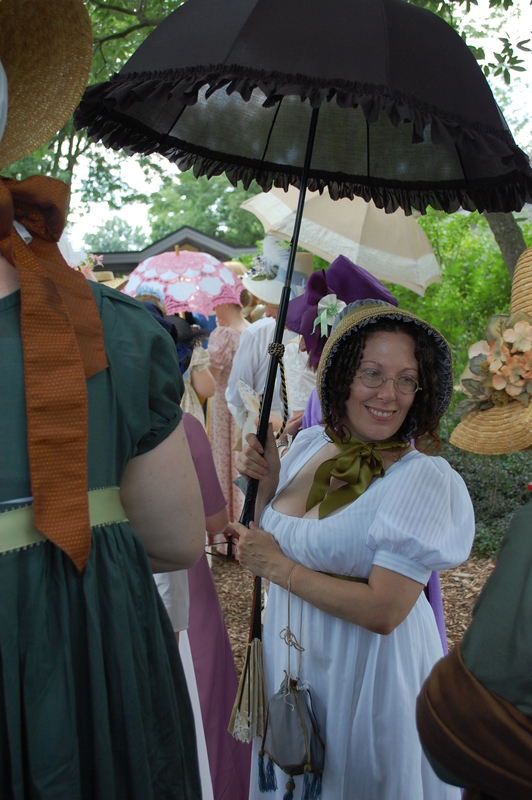 The Jane Austen festival, put on the Jane Austen Society of North America-Greater Louisville Chapter is just days away! The girls and I are super-excited to attend this year-and we decided to step up our game in terms of our Regency wear. Last year, we were amateur festival goers. We had no idea what to expect. Three dresses from Goodwill and a few well-placed ribbons had to suffice. Not this year! We are planning to be part of an attempt to set the Guinness Book of World Records for the most people in Regency attire in one place. So we need to look the part. 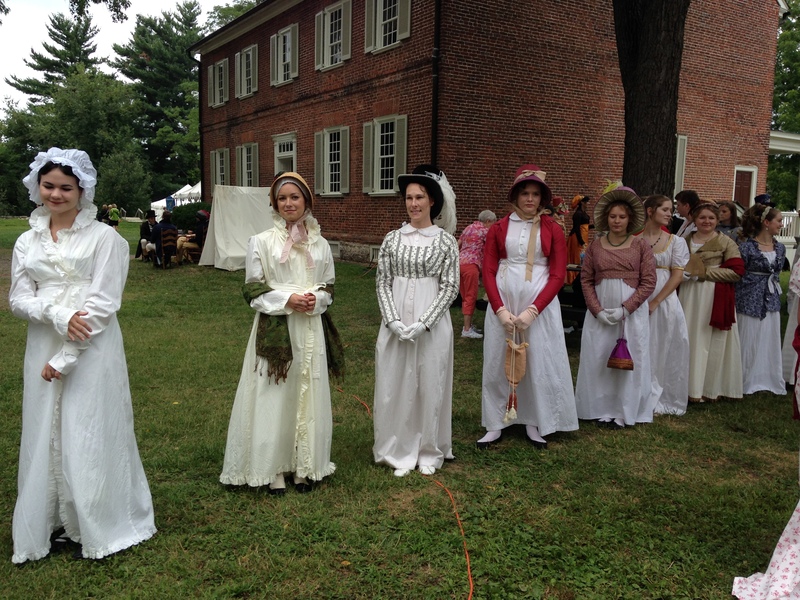 I learned so much about period costuming during last year’s fashion show… what a feast for the eyes! Look at this gorgeous hat, parasol, and dress. I learned a lot about mixing colors and fabrics. This year, I had planned to make our dresses, going so far as to buy a pattern. But you know how it goes when you’re working full-time and taking care of kids and blogging and before I knew it, it was June and I was in a panic. Thank goodness we live in the internet age. 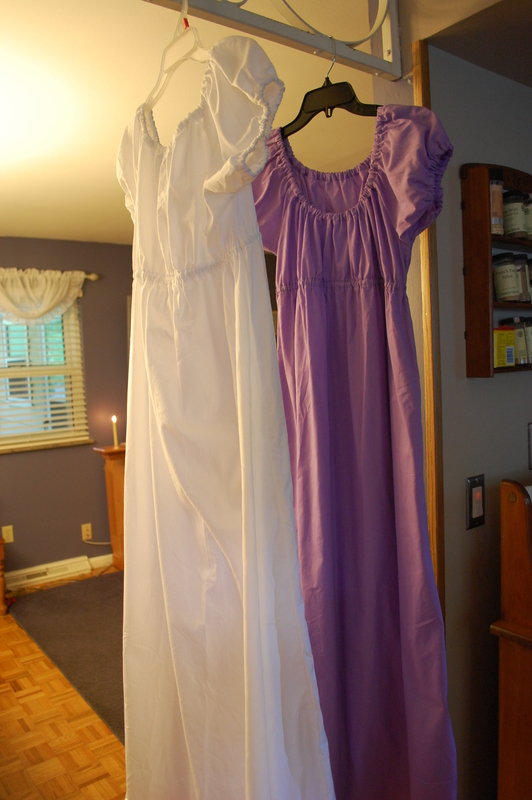 After an extensive search, I found two Regency dresses, one in white and one in light purple, on Ebay sewn by a woman in California for $20 a piece-a steal! 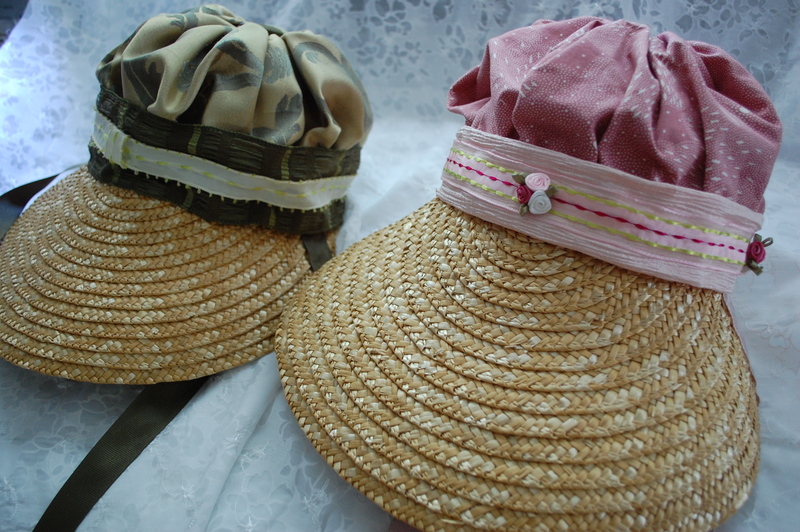 They were both the same size and came with a waist ribbon-and are very plain-all the better to customize! The dresses were well made, if not plain but that gives us lots of room to customize and change them. We decided my 13 year old would wear the white dress with the green waist ribbon. We didn’t want to add any trimmings to it. Instead, we decided that she would carry a reticule and a “shawl”, which I made this past weekend out this material-it was the most “Indian” looking fabric I could find at my local store. 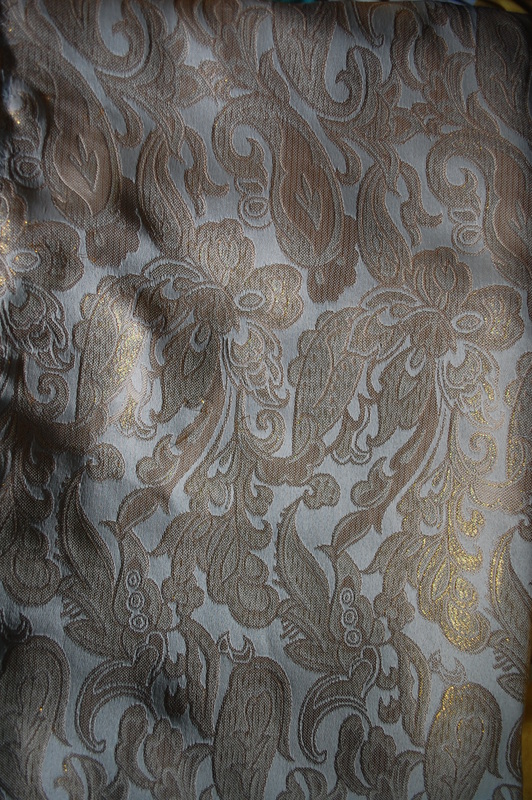 This is the material I used to make Lily’s draped shawl. 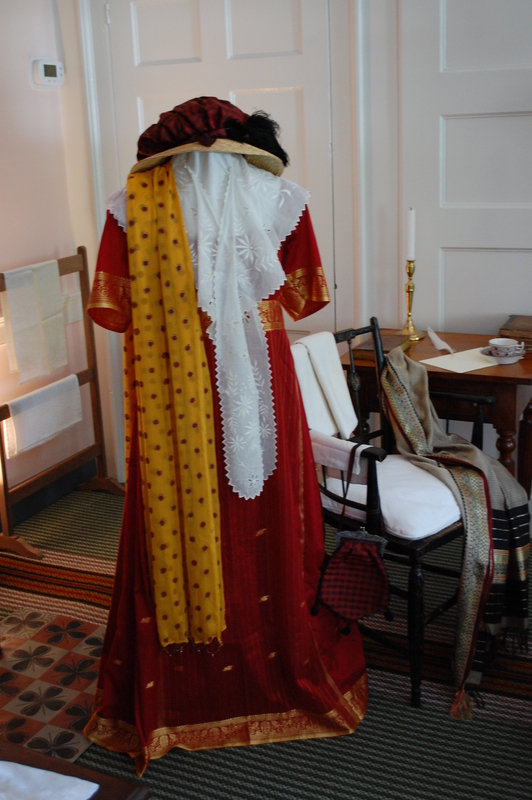 Regency lovers will know that British trade with India was feverish during this time period-many women actually had their dresses made from sari’s. My 9 and a half year old is wearing the purple dress. 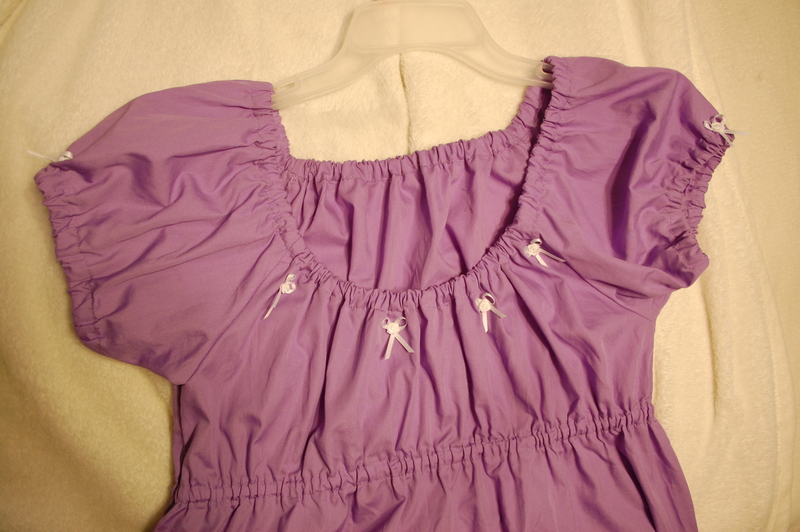 I put in a hem and added ribbon bows to the sleeves and around the bodice. It’s not terribly fancy but I think the bows are girlish and cute. I found bonnets for both girls on Etsy for $22 a piece. They are really pretty and perfect to match the dresses. And Lily’s came with a reticule-bingo! 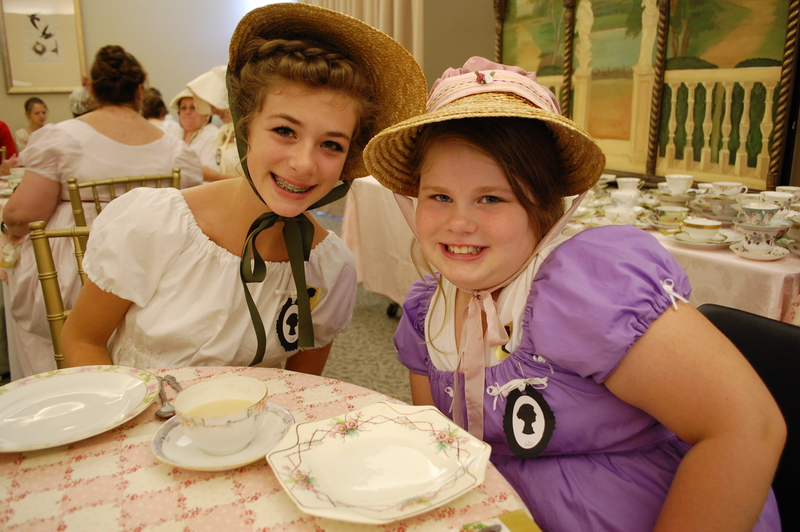 Both my girls love their outfits-so much so that, earlier this week, they decided to do some chores dressed in their full outfits-bonnets included-and then they treated themselves to tea and cookies. As for me, I’ll be wearing the same dress as last year. I hope to have time to attach new bows attached to the bodice and sleeves and to make a fichu from from this gorgeous material. 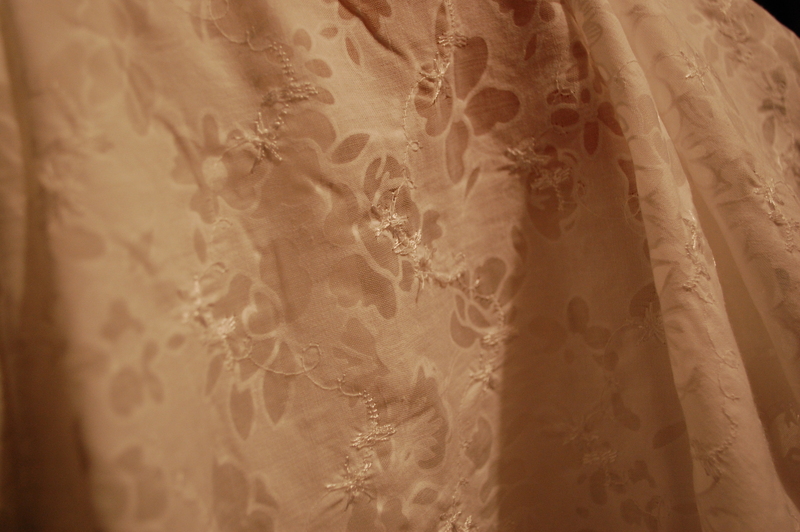 A fichu is a large, square kerchief worn by women in the 18th century to fill in the low neckline of a bodice. I also made myself a bonnet. I ordered a straw hat off Amazon for $13-it came with a circle cutout at the back of the neck and a chiffon scarf tied around the brim. 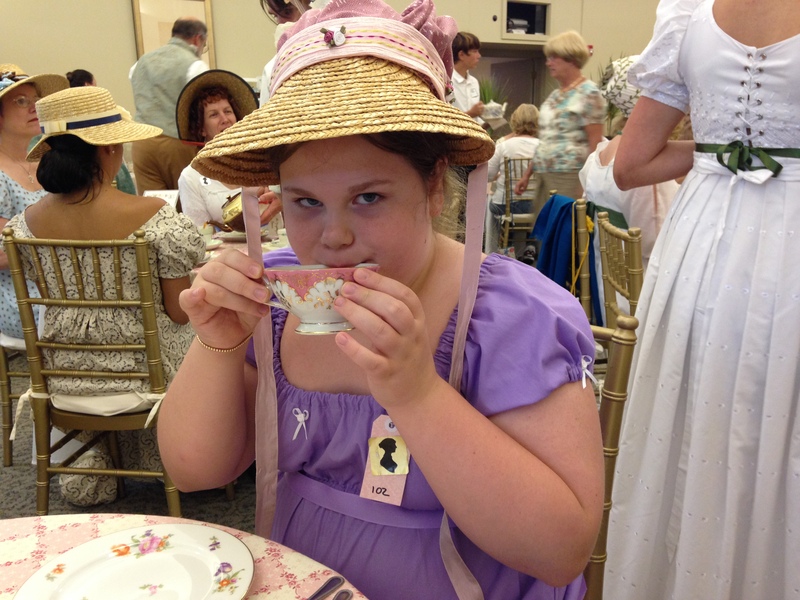 All I did was untie the chiffon and reposition it under my chin, and the whole hat folds into a bonnet. I added a few flowers to the brim for color. 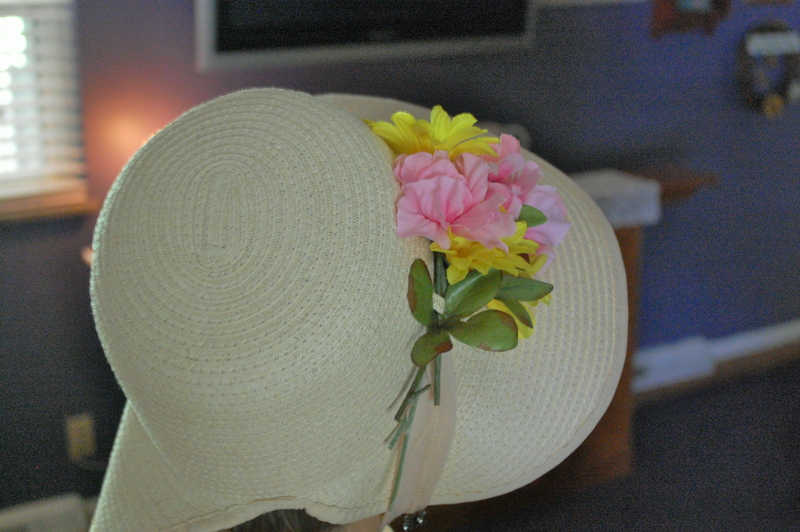 The back view of my self-made bonnet. The biggest problem I face now is shoes. 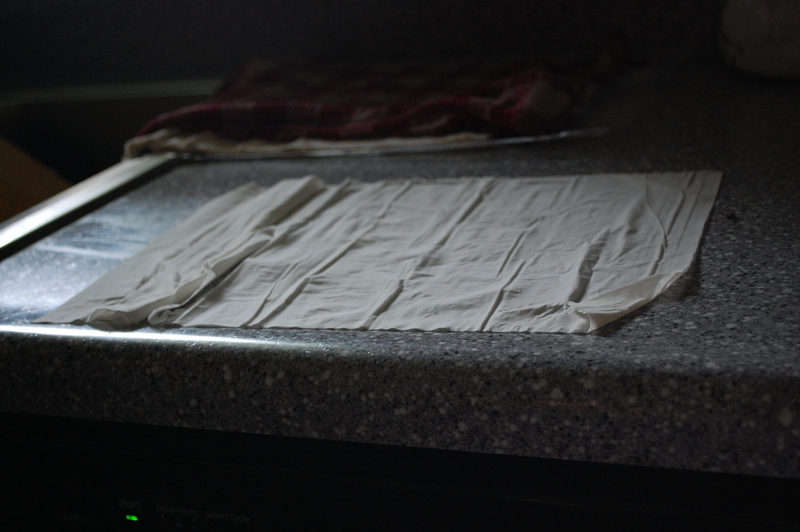 The girls both have cotton broadcloth flats that will pass. I could wear the same shoes I wore last year, but they are heels and they hurt my feet after awhile. Think anyone would notice if I wore flip flops?? 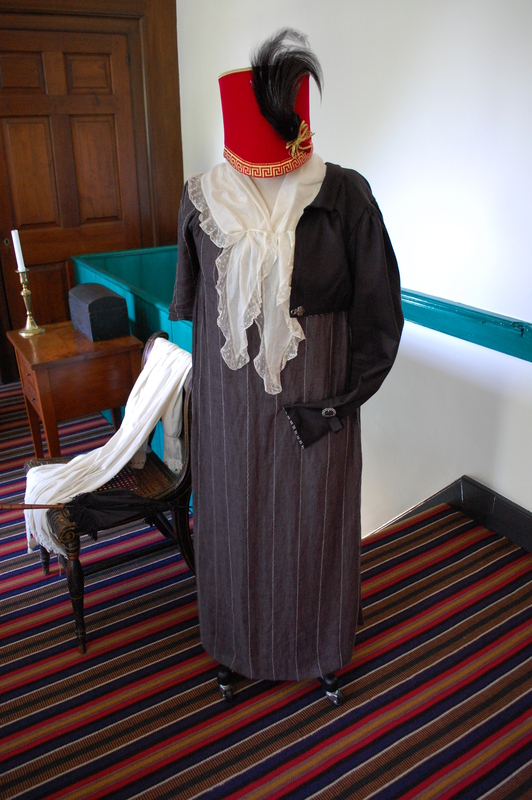 I hope this passes for better Regency wear! I am certain we’ll gain new insights during this year’s fashion show and during our time wandering around with the other Regency lovers. If you’re going on Saturday, look for us and be sure to say hello, since you know now what we’ll be wearing! 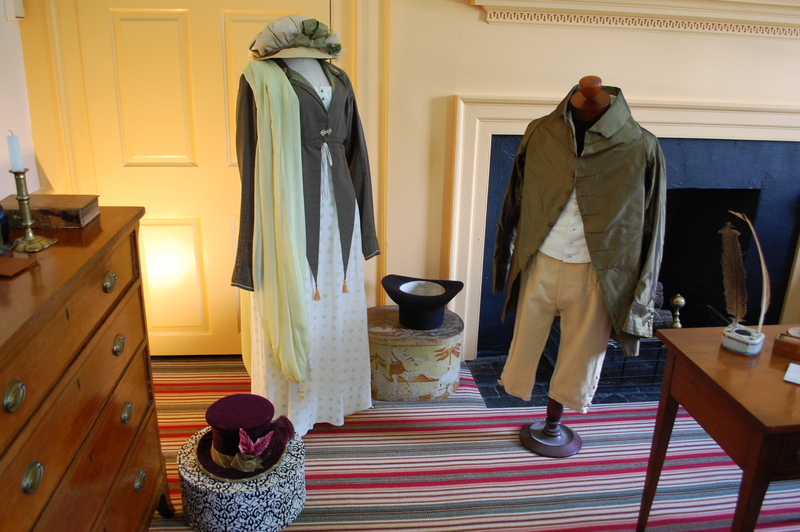 The gentlemen of Jane Austen’s day were fond of hunting and hunting parties were often rowdy, weeks-long affairs with hunters moving from one grand estate to another. Their wives followed, and often there were huge dinners and dances held in private ballrooms to celebrate-and partake of the day’s catch. Among the popular game of the day was venison, rabbit, duck, and a host of different birds including woodcocks, pigeons, and pheasants. 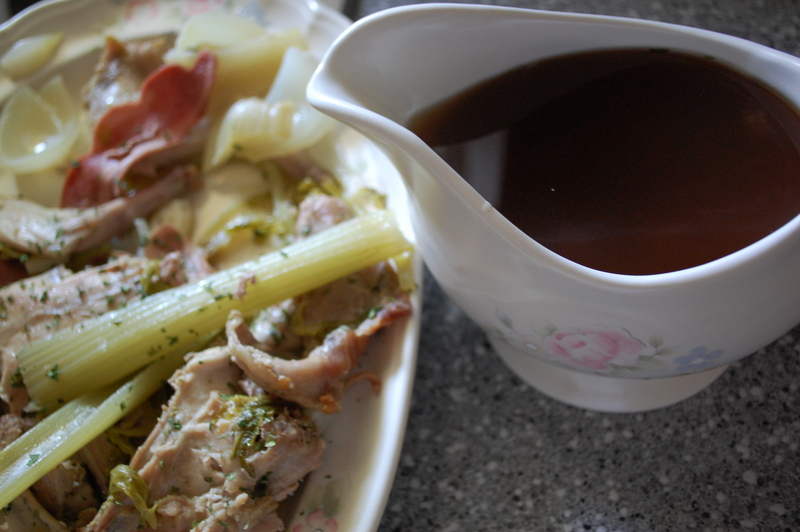 This recipe, from Cooking with Jane Austen by Kirsten Olsen, is specifically made for pheasant. The cookbook says pheasants were not a common domestic fowl but would have been available at the finest of estates. The bird was much admired for its plumage and was often cooked with the feathers on, wrapped in paper to prevent them from burning. 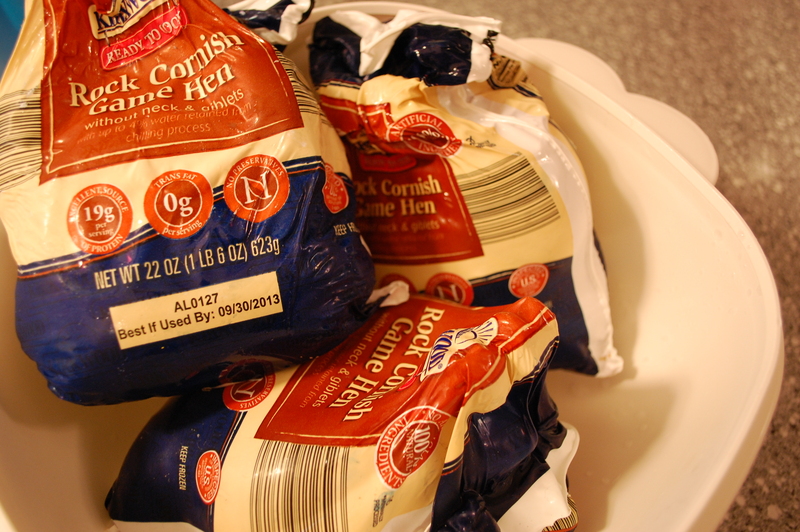 There is one major grocery store in Cincinnati which likely has pheasant-but I did some research and found that a suitable substitute is the tender chicken cousin, the Cornish Game Hen. Three hens ready to be stuffed and roasted! This recipe is great for any small Christmas gathering in place of turkey-it’s a beautiful presentation and it‘s so easy to prepare. 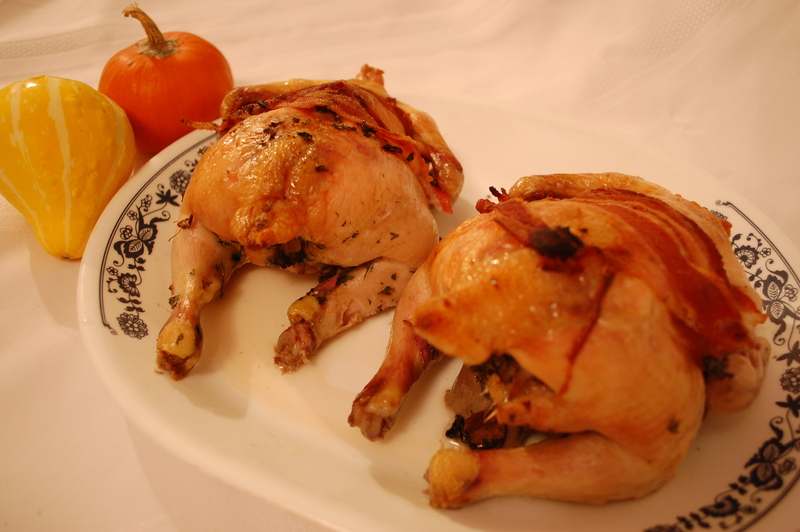 Each hen serves about two people. Roast them either drawn or larded, or with a stuffing made with the livers minced, with grated bacon, parsley and scallions shred fine, pepper and salt, and covered with slices of bacon and paper. Serve them with sauce a la Provencal, or any other sauce in the fashionable taste. They may be served also in patty hot or cold, or in a tureen. Preheat the oven to 450 degrees. 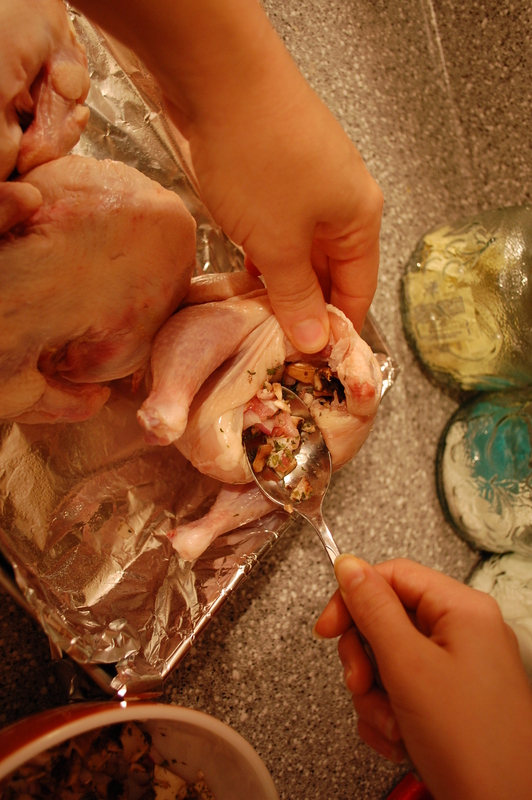 If the bird comes with giblets, remove them. Wash the bird and pat it dry, then lay it in a roasting pan that’s been lined with foil and sprayed lightly with cooking spray. 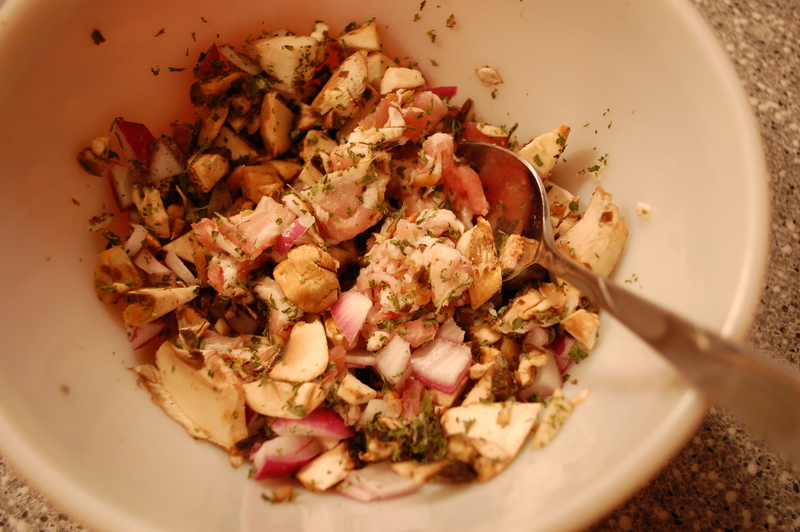 In a small bowl, chop the giblets, and mix with three strips of bacon chopped, the parsley, mushrooms, and onion. Add a little salt and pepper. Remind to ALWAYS stuff my birds from now on with bacon. Why didn’t I think of that before?? 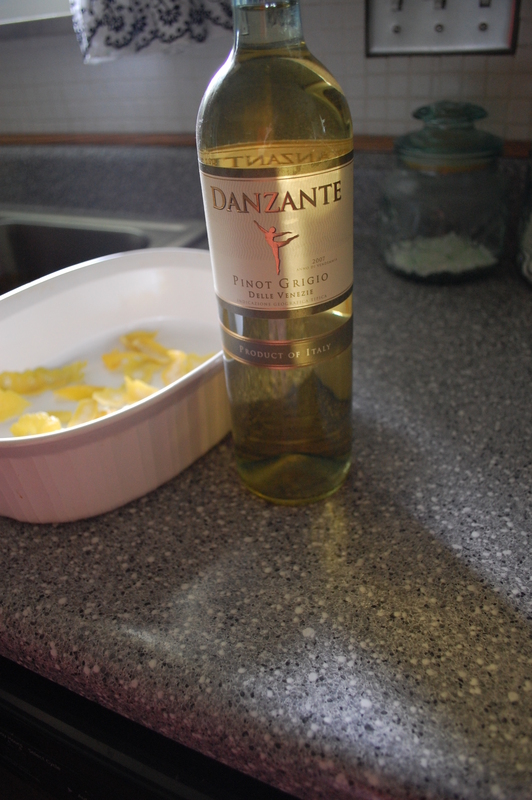 Stuff the bird with this mixture. 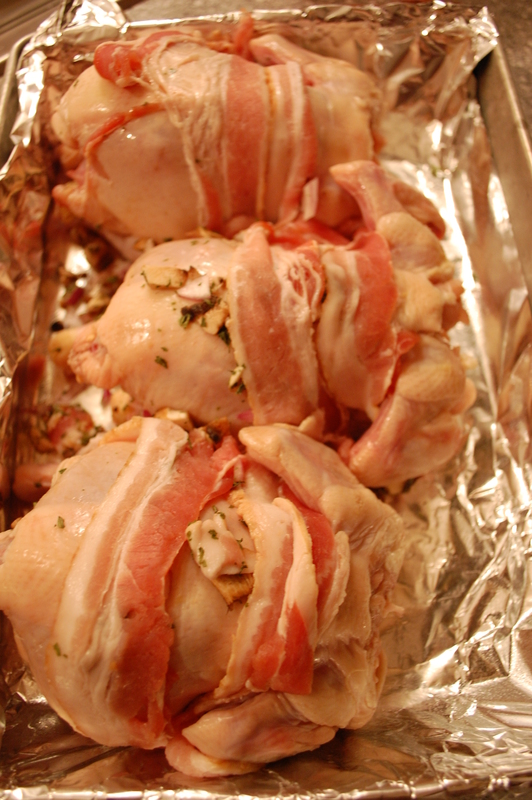 Lay two more strips of bacon across the breast of each bird. They’re stuffed and wrapped in bacon. 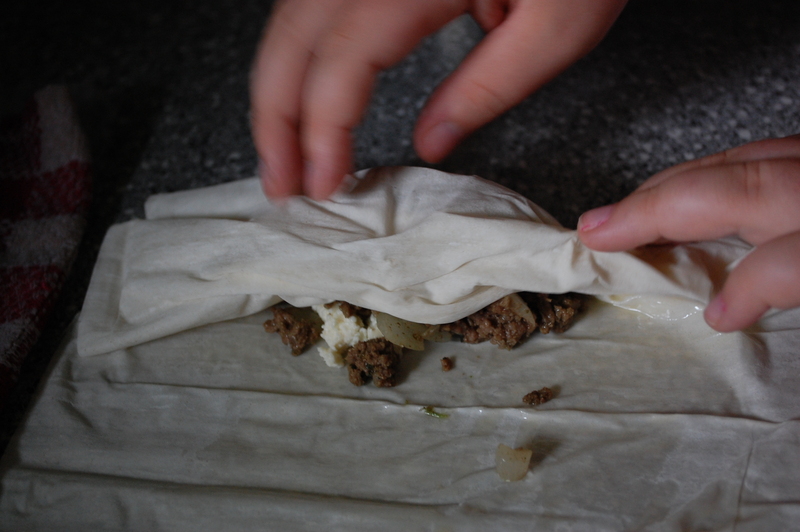 Again, I say, why have I not thought of this bacon-wrapping thing before?? Roast until the temperature at the inner thigh reaches 180 degrees farenheit. Mine took about 45 minutes. 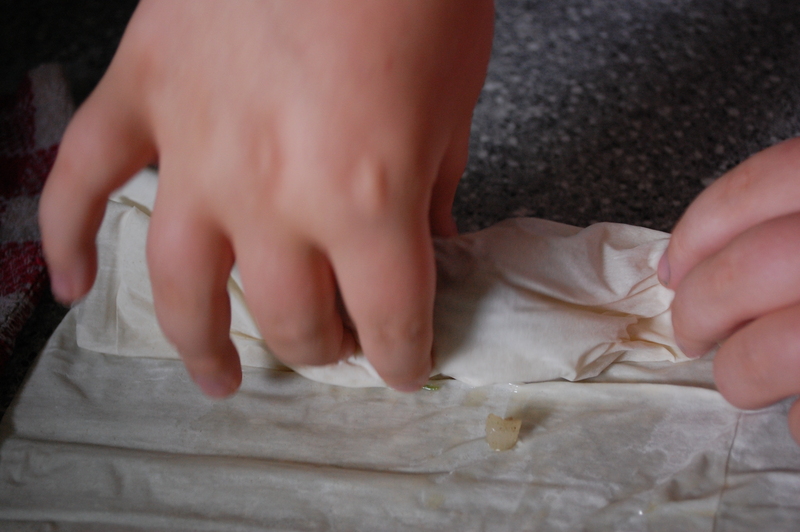 If the skin begins to brown too quickly, reduce the heat to 425 degrees and cover the birds loosely with parchment paper. 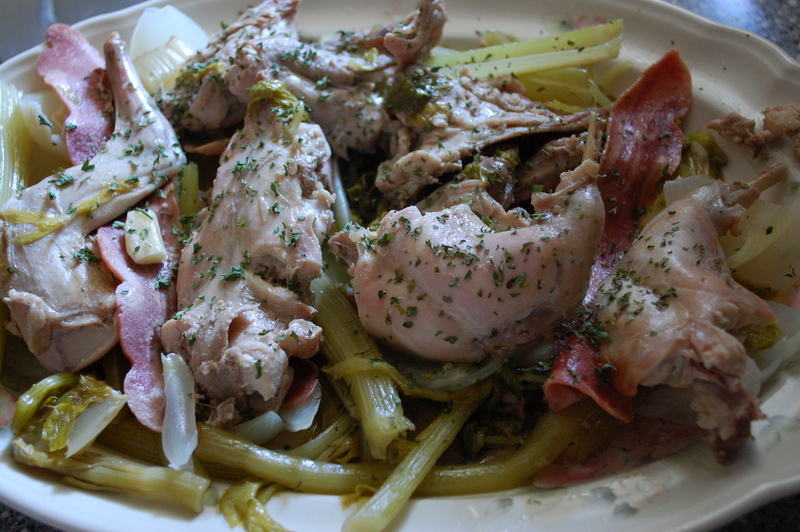 It may not be a modern meat choice, but rabbit-or hare was a familiar part of the Regency table, namely because they were plentiful and easy to catch. If you are a fan of Jane Austen novels, you become familiar with the “seasons” observed by the gentry in her time. Families often spent their summers in London, attending balls, operas, and dinners. But in mid-August, they returned to their country estates for several months of “shooting season” where they would hunt game including birds, fox and rabbits. I obtained my rabbit through less exciting means (thanks mom and dad!) but it is a really interesting meat to work with. Rabbits have no fat. Their meat is dark and tastes very much like chicken (insert joke here). 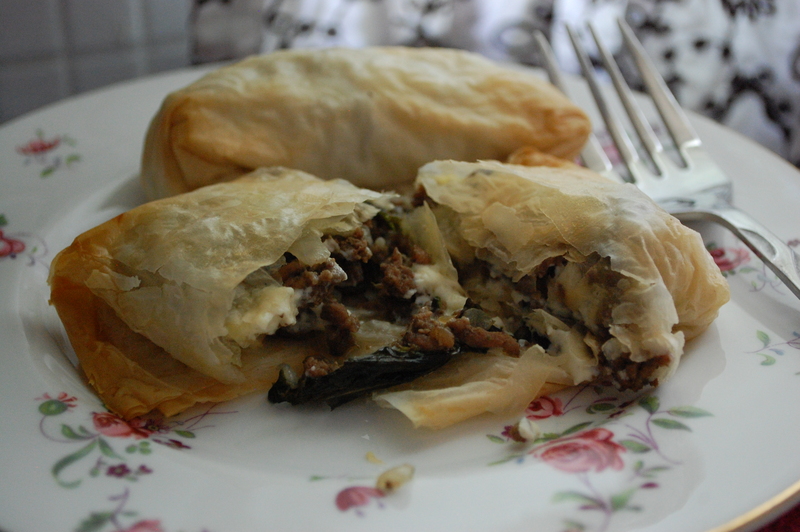 They are delicious when properly prepared and because they are so unusual in the modern world, it can be an interesting dish to bring to table. Skin it, take out the entrails, and put it over the fire a few minutes, with butter of fat, then lard and roast it, and when it is done serve it with sauce and vinegar, and pepper and salt, which should be served in a sauce-boat apart. After reading through the modern version, I deemed the preparation too bland. I added the vegetables to give it some flavor when roasting. 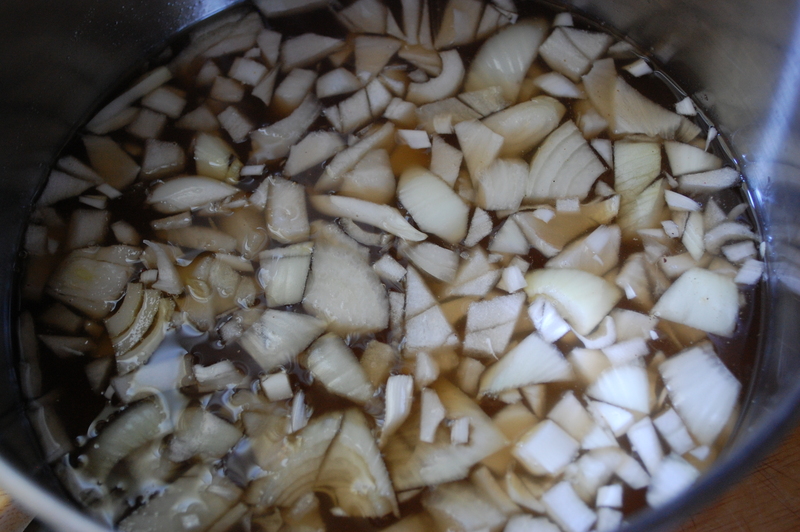 The onion sauce smells horrible when cooking-thanks to the addition of the vinegar. I thought it was going to taste terrible. I put it in sauce dishes so my girls and I could dip the meat into it as we liked. Much to my surprise, it really was good! It’s a bit of a tang that really compliments the rabbit. 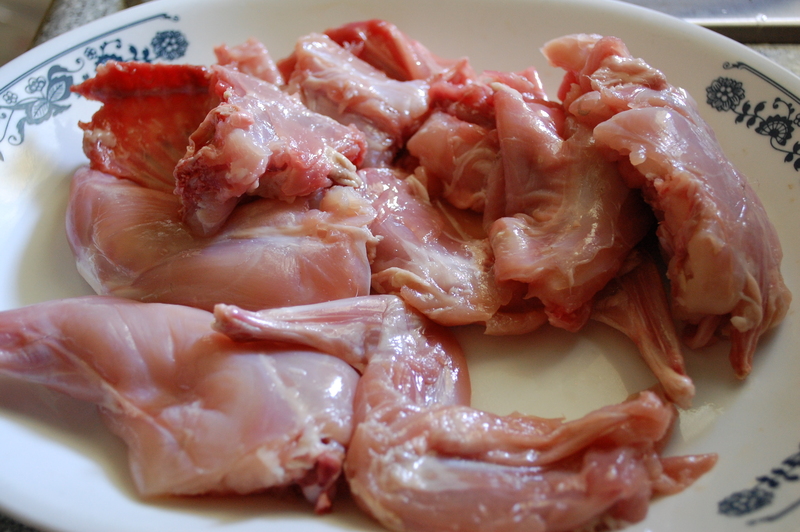 Cut your rabbit into serving pieces-I took off both legs and then sliced the breast and back, so I had about seven-eight small pieces in all. In a large pan, melt the butter over medium heat and add the rabbit. Brown on all sides. 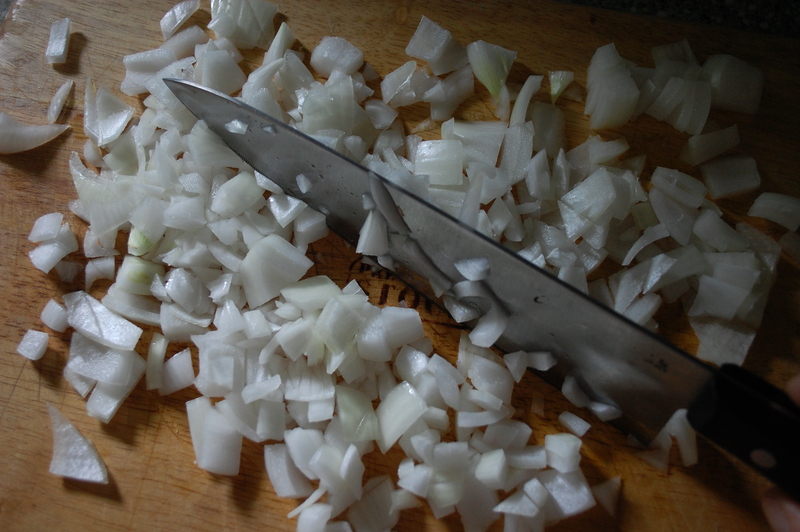 Meanwhile, place the celery, the quartered onion, and garlic in a roasting pan or dutch oven. When the rabbit is browned, pour the rabbit and butter on top of the vegetables. 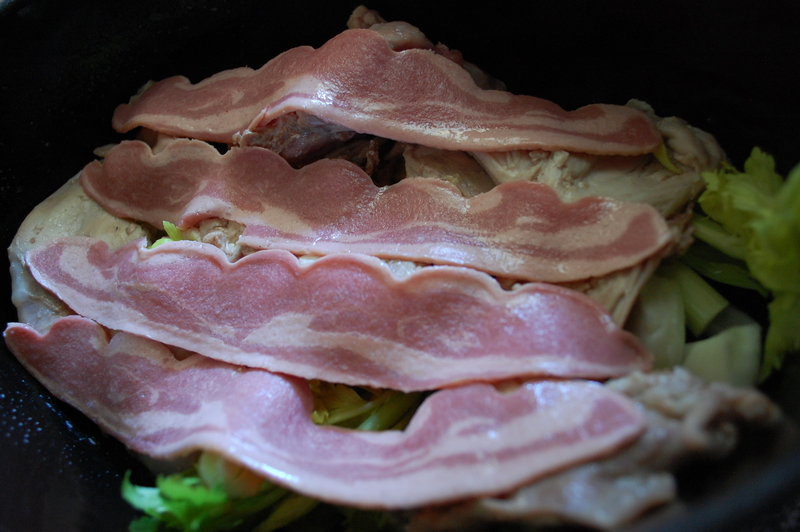 Cover with the bacon and add about ¼ cup water to the bottom of the pan. Roast for 30 minutes or until cooked through. 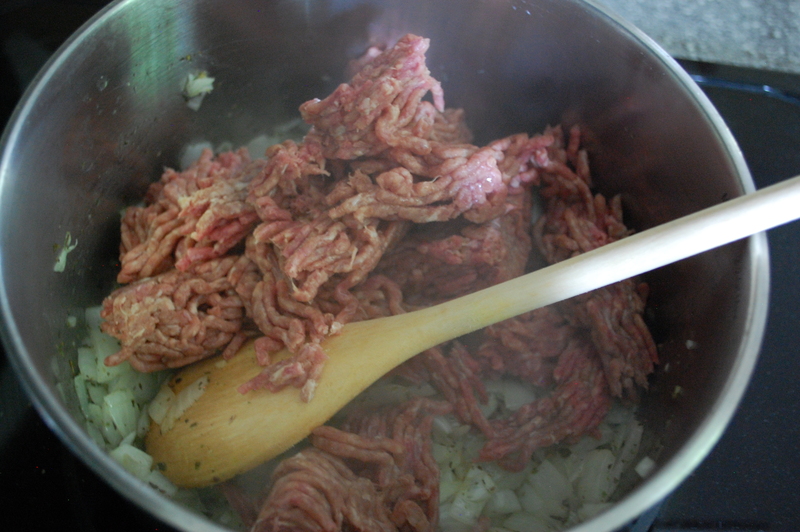 Meanwhile, place the diced onions, beef broth, vinegar, salt and pepper in a saucepan. 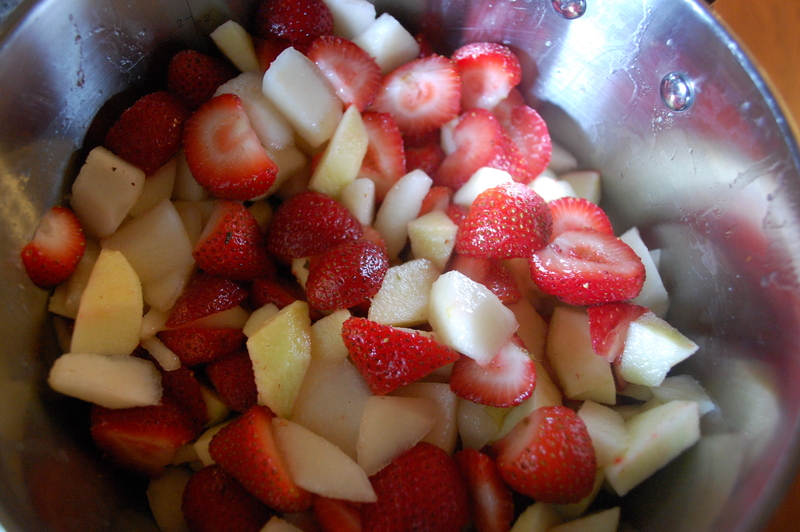 Bring to a boil, then reduce heat and simmer until the rabbit is cooked through. 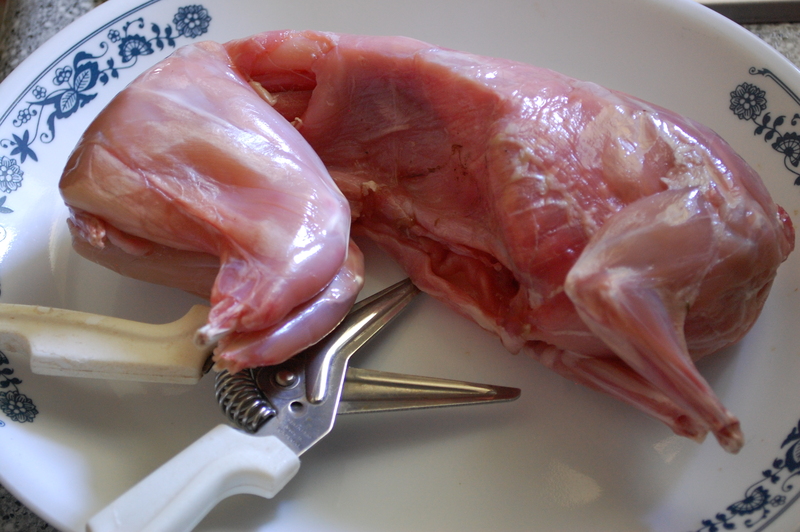 Note: if you’re really squeamish about eating rabbit, use chicken! At last, the day we’ve waited for finally arrived this past weekend! 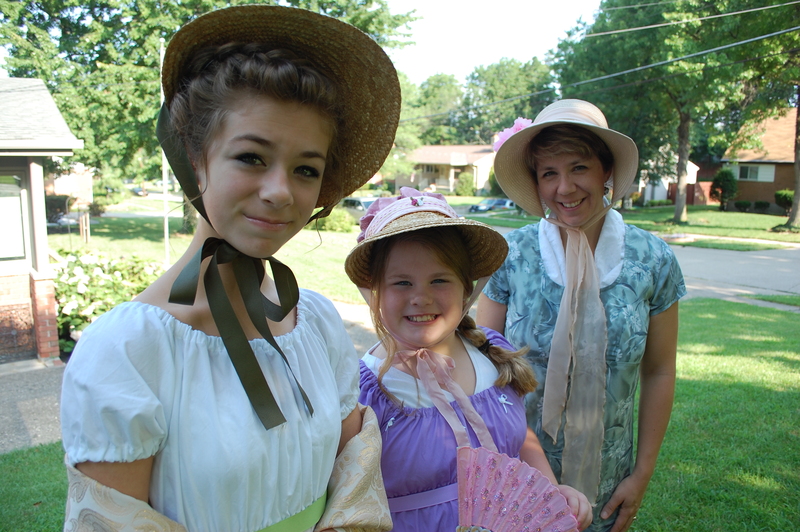 My history-loving girls and I headed to Louisville, Kentucky for the 5th Annual Jane Austen Festival, put together by the Greater Louisville Jane Austen Society. It was everything we’d hoped it would be. 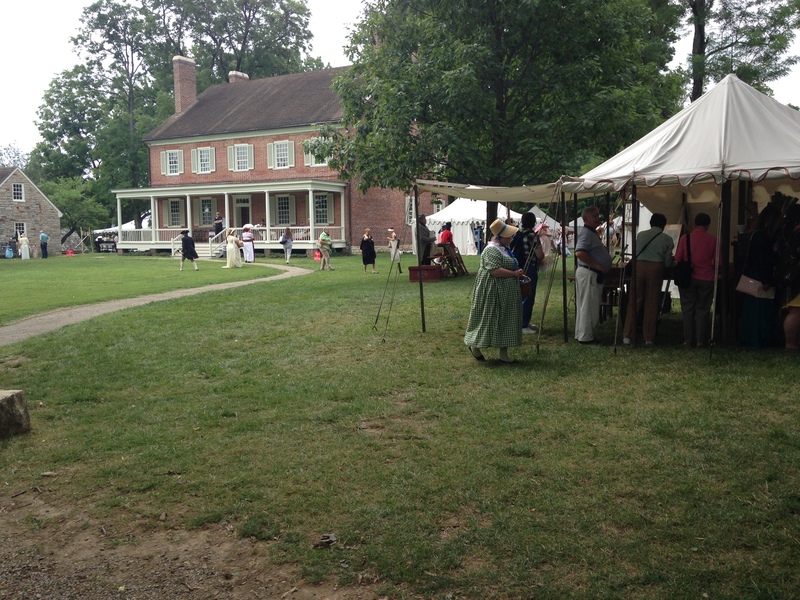 The event is held at Locust Grove, a National Historic Landmark. 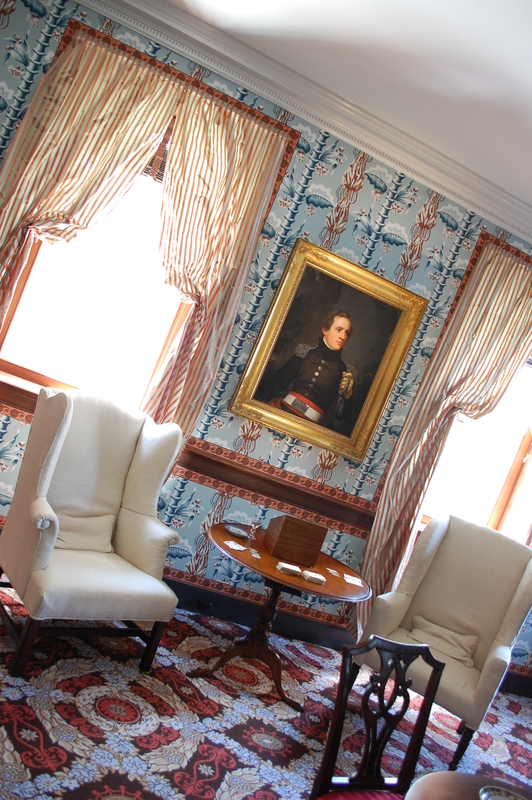 It consists of 55 acres of the original 694 acre farm established by William and Lucy Clark Croghan in 1790. William Croghan was the brother-in-law and surveying partner of George Rogers Clark, founder of Louisville and Revolutionary War hero. 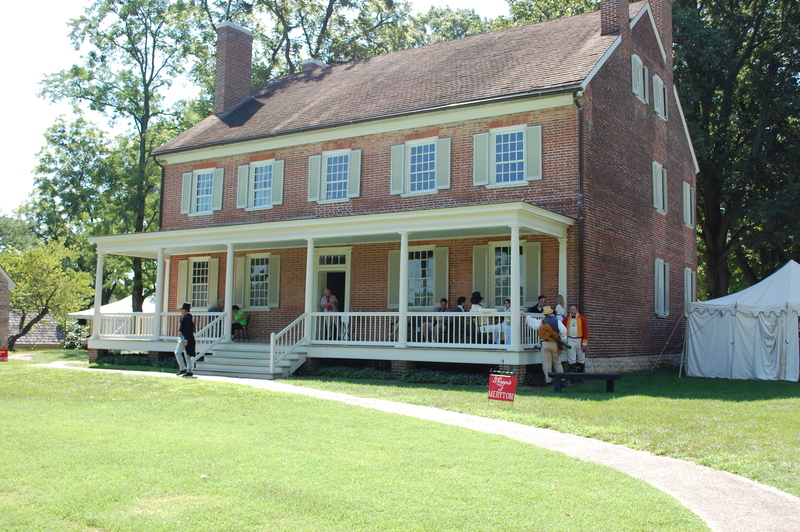 The farm and the Croghan’s played host to three U.S. Presidents-James Monroe, Andrew Jackson and Zachary Taylor-and was a stopping point for famed explorers Meriwether Lewis and William Clark (brother of Lucy) upon their return from their expedition to the Pacific. Food was not the focal point of the festival. 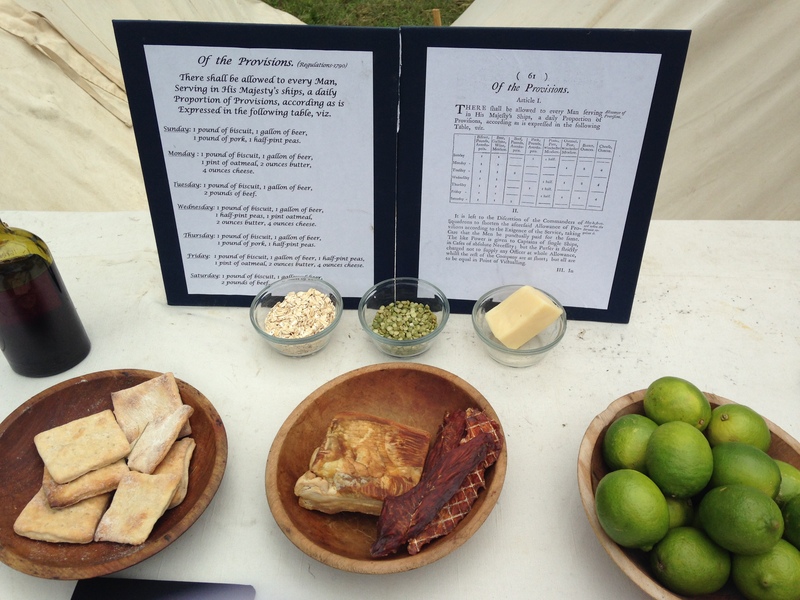 As such, I’m going to spend one blog talking very little about food because there is much of historical significance to see and experience at the festival-and it deserves to be shared and praised! I assume most of my blog readers are history lovers-so you’ll forgive me this one little indulgence off-topic. Check out the master bedroom toilet! 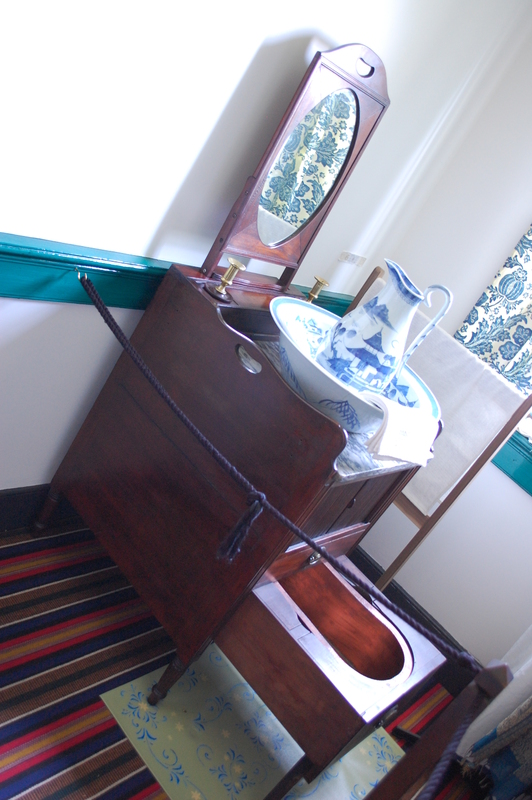 The mirror slides down into the cabinet and the toilet slides in, so it could be carried along on a wagon whenever the family traveled! 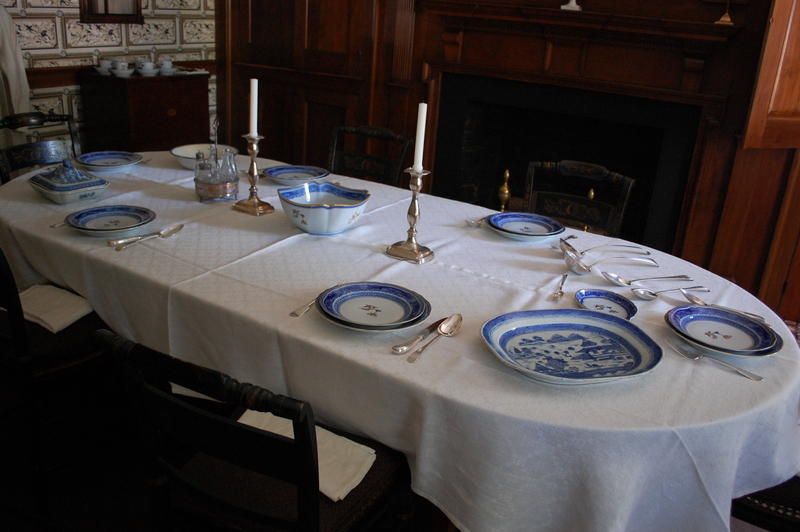 Of course, I spent a little extra time in the formal dining room. 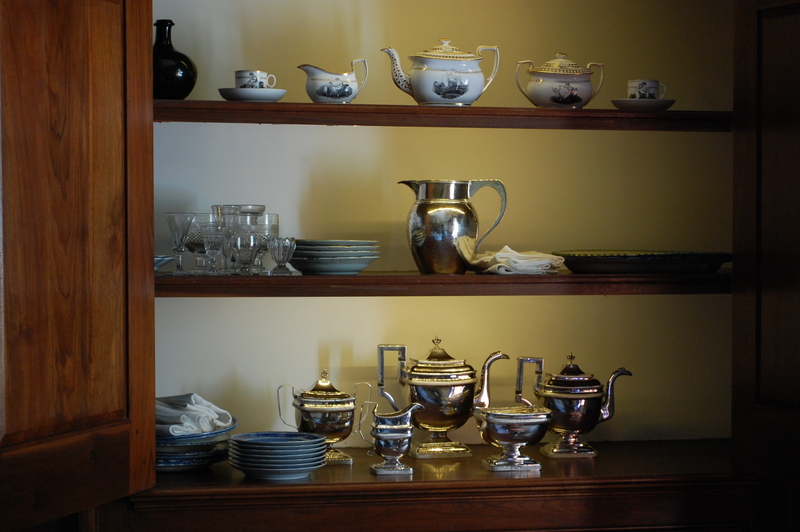 The table was set for the soup course and I also managed to snap a shot of the tea cabinet. The pattern was pretty bland and not at all frilly-perhaps that tells us something of Lucy’s personality. 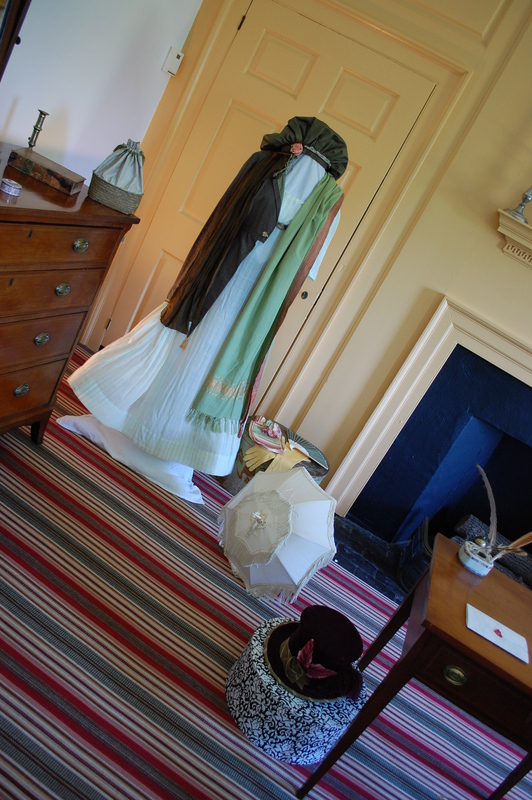 There were many Regency era outfits on display inside the home. They are not vintage-they were designed and sewn by Gayle Simmons. I’m usually a very tidy person but I love seeing pretty hat boxes strewn on the floor! 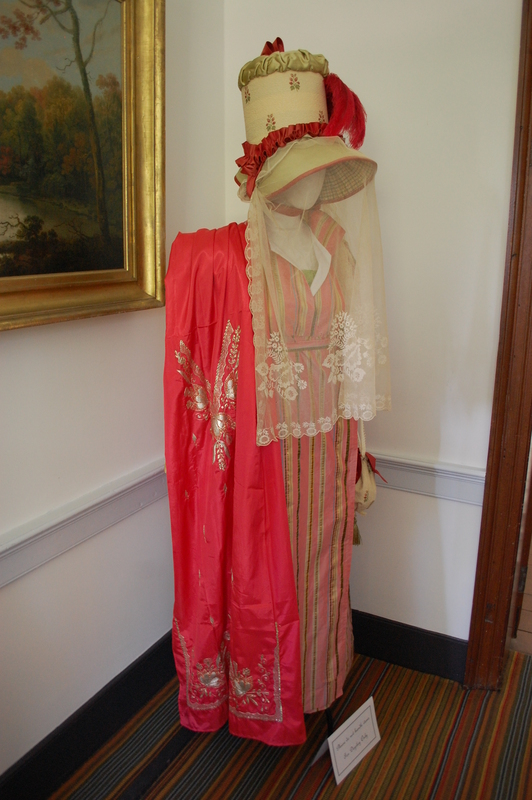 During certain historical periods, women’s fashion is often inspired by military dress-as is the case with this ensemble. I love the color of this outfit. The designer explained the oriental influence of the time, and the use of sari’s as shawls, drapes, or as part of the dress. 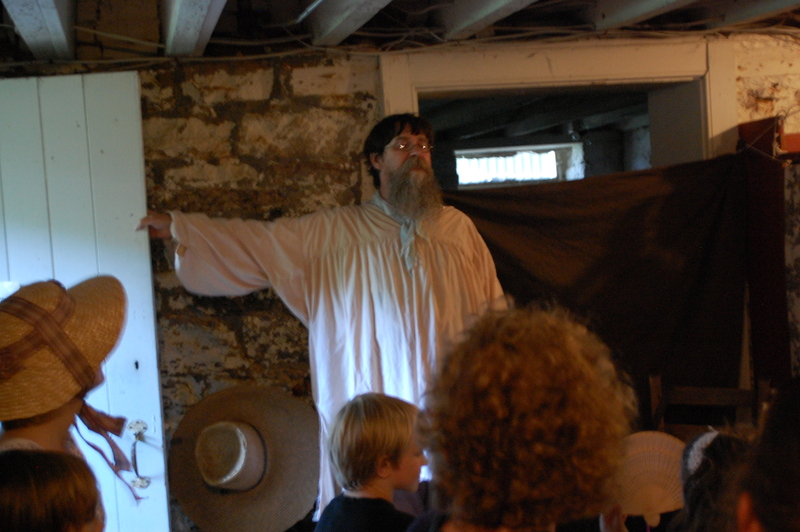 The veil would be worn to keep bugs out of one’s face while riding on horseback or in an open carriage. I loved both of these. 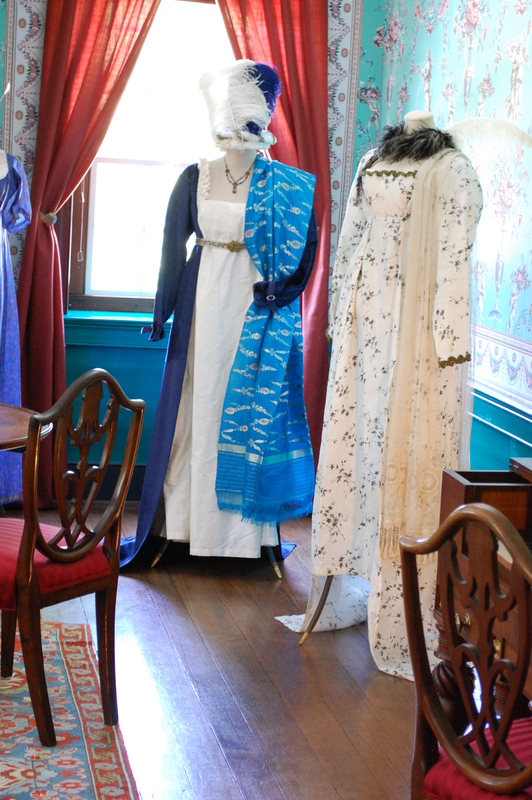 The white and black dress is more of a ballgown and the blue and white dress would have been for a formal dinner. Feathers were a popular accessory! Another example of a dress made of a sari. I love the poofy bonnet. 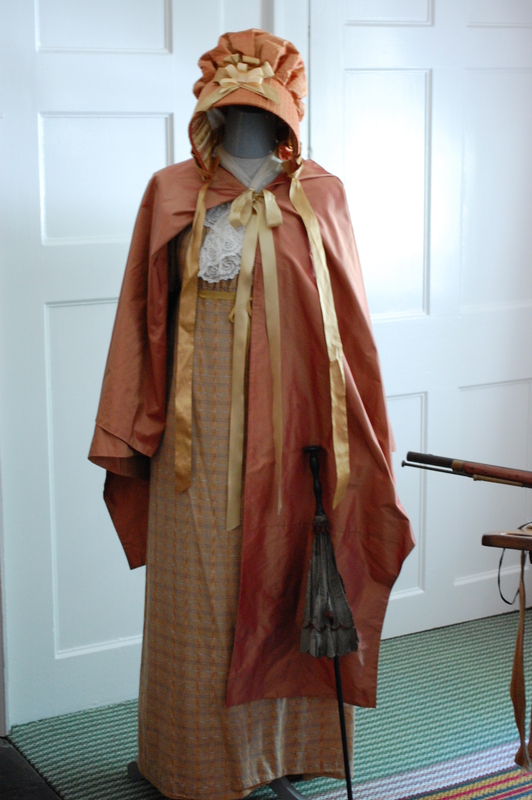 Here’s a day dress with an overcoat, bonnet, and parasol used for walking. The parasol was meant to keep the sun off one’s skin and not to dodge raindrops! 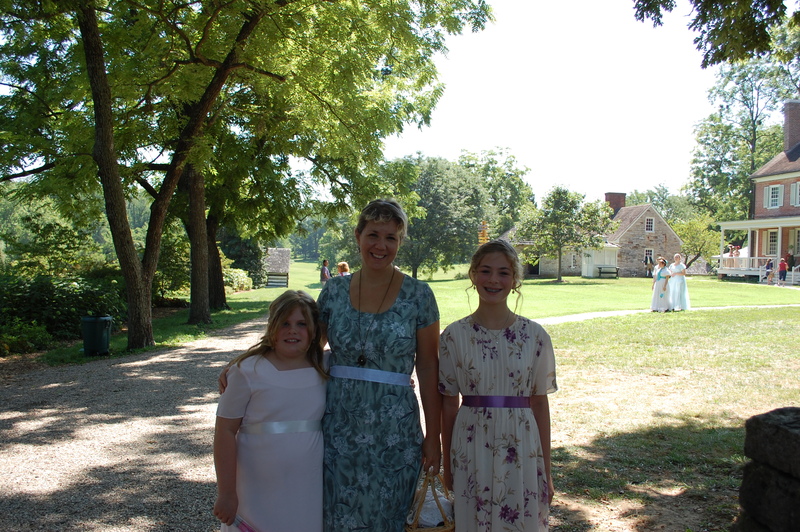 Now, the girls and I really wanted to dress Regency but, with limited time and budget, we sort of “made it up”. We got three empire-waisted dresses from Goodwill, in appropriate colors/prints for the time, added a wide ribbon sash, and pulled out our vintage jewelry and fans. 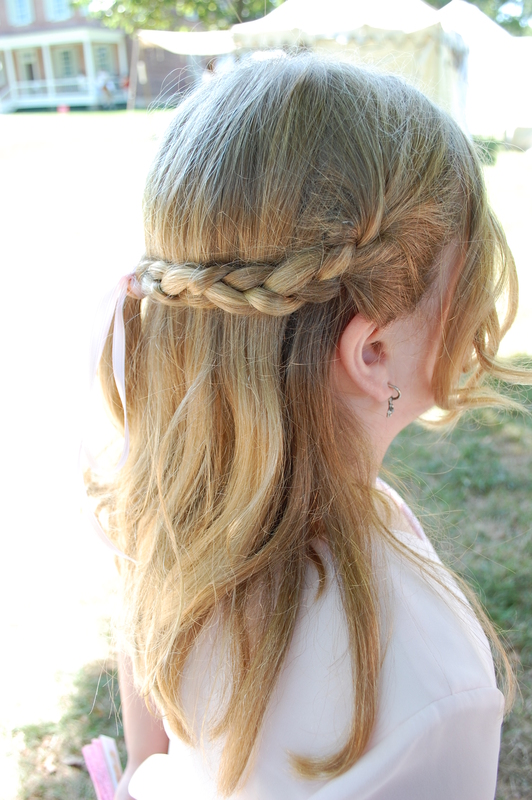 I was most proud of my work on my eldest daughter Lily’s hair. She has thick, wavy locks like Kate Winslet in “Sense and Sensibility” and that inspired her style. I braided it, worked it into a bun, and wrapped ribbon around her head, Grecian-style. 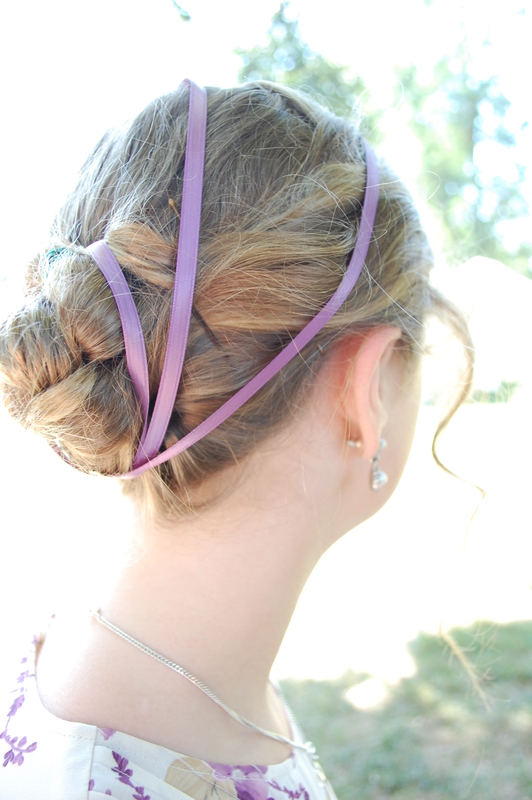 My younger daughter Ella had two braids brought together in the back, with loose curls and a ribbon. We won’t even discuss my hair. Let’s just say, it’s not very pretty pinned up. I will be wearing a bonnet next year!! 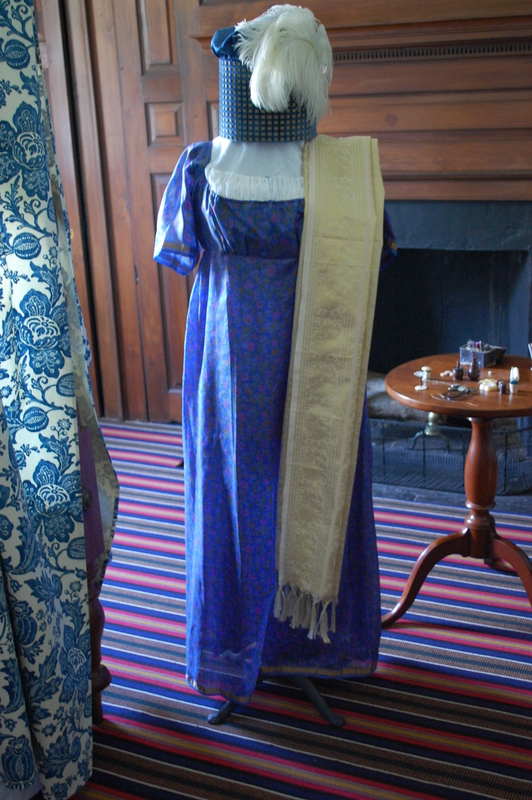 We also attended an hour-long Regency fashion show, where we got to hear historic clothing designer Betsy Bashore describe her costumes in detail. I got a lot of ideas for next year! I love this hat and parasol. A straight feather adds character to this hat. An excellent example of how you can use a sari to create a dress. The only thing that worries me about making a regency dress is the back pleats. You can see the add a lovely fullness to the train-but pleats are not always very easy to sew, if memory serves me correctly. Lily loved this later Regency style, with more ruffles and lace and trim around the hem. I loved this Roman helmet hat with the flashy feather! This is a darling, youthful hat that reminds me of Little Bo Peep! 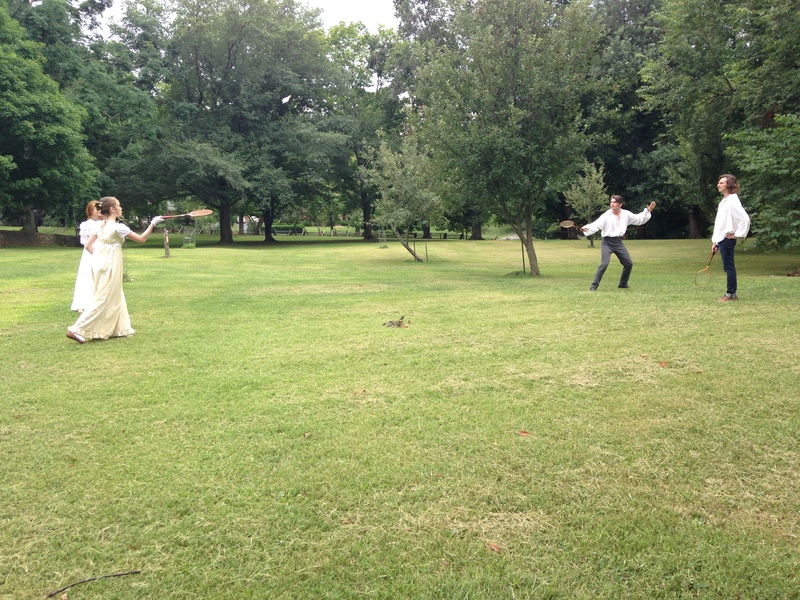 The festival also featured a bare-knuckle boxing match, side-saddle riding demonstration, a lecture on the illnesses of Jane Austen, a one-woman dramatic production, and a duel! In addition there were many, many shops full of everything from clothes to wooden swords to books, fabric, vintage buttons, and tea. 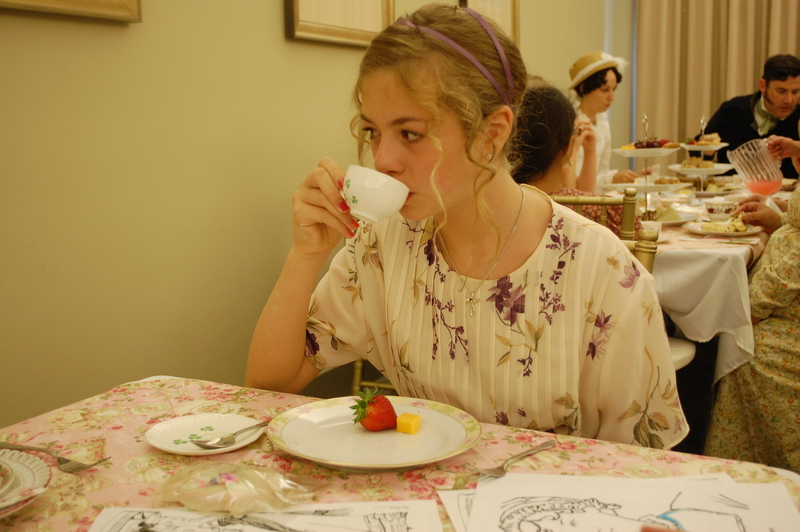 My girls each got a quill, ink, and inkwell and I bought two boxes of tea from Bingley’s Teas, which had a lovely setup so you could sniff each variety in their Jane Austen series. There were also two varieties available to taste test! The girls and I choose “Compassion for Mrs. Bennet’s Nerves”, containing chamomile, peppermint, passion flower, rosehips, and lavender, and “Treasures from the Colonel”, a spicier blend. They come in beautiful boxes designed to look like books. I also bought a cameo on a chain, although I failed to make note of the merchant. The first thing the girls did when we got home was to write with their new quills. We set a few rules and the process is not nearly as messy as I thought it would be. 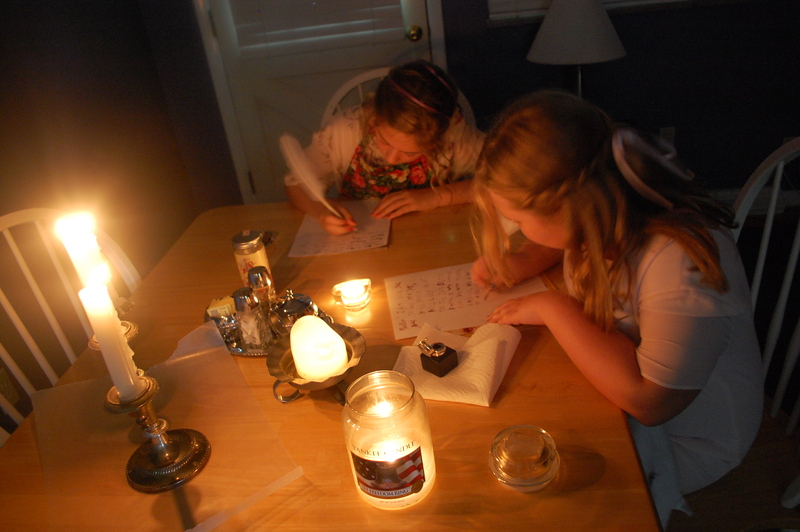 Lily says you can’t have a regular electric light when using a quill-only candles will do. We also attended a shadow puppet show, put on by Pat and Becky Richardson of Indianapolis, Indiana. It was really neat-but the stories, I should warn you, are kind of scary! Pat explained that children’s fairy tales of old are vivid stories with clear, moral lessons-like the girl who burns to ashes because she played with matches! 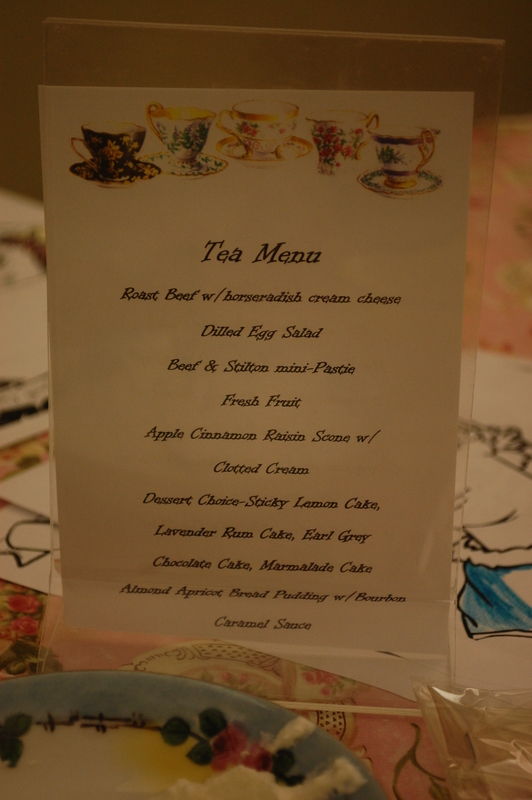 Finally, we attended the children’s tea in the afternoon. 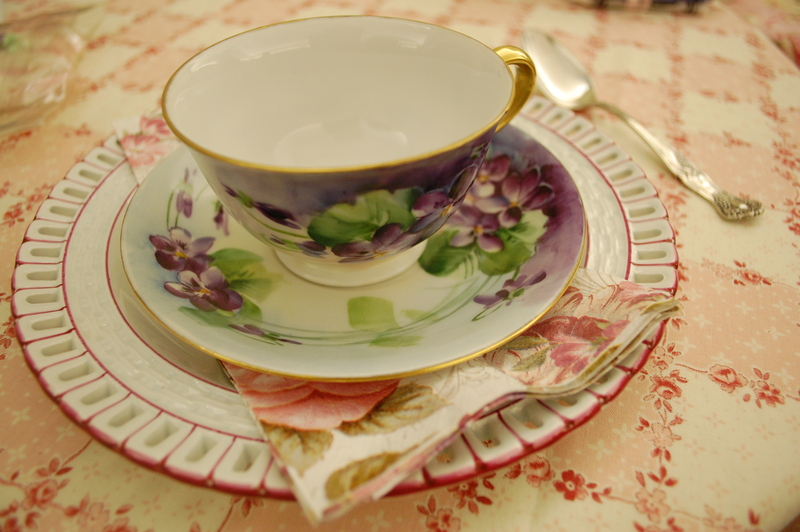 The service was really attentive, and the china, mixed and matched on the tables, was beautiful. 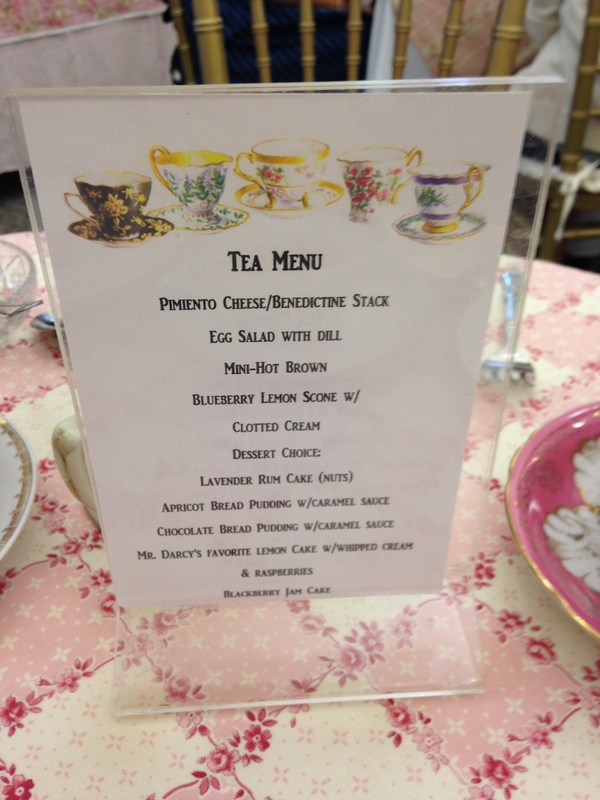 Each child got to take home a teacup and saucer-both my girls really liked the souvenir! The festival also includes a ball on Saturday night and other seminars. There is so much to do! It was a most wonderful day and we will certainly go back next year!